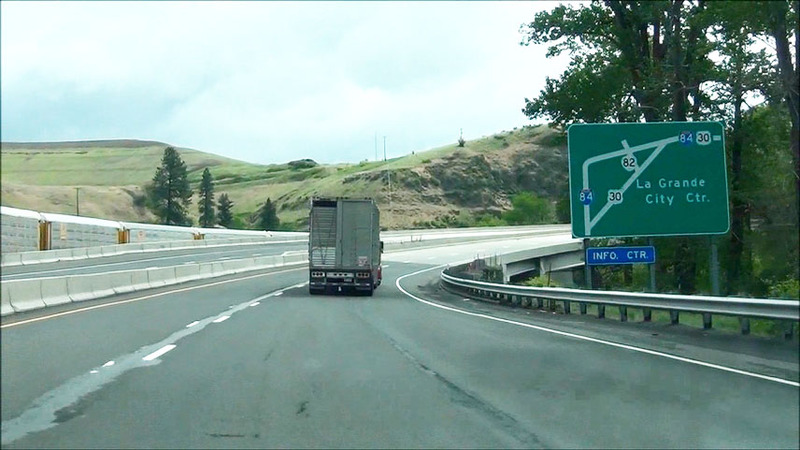 Interstate 84 East at Exit 180: Westland Rd / Hermiston (Photo taken 5/22/13). 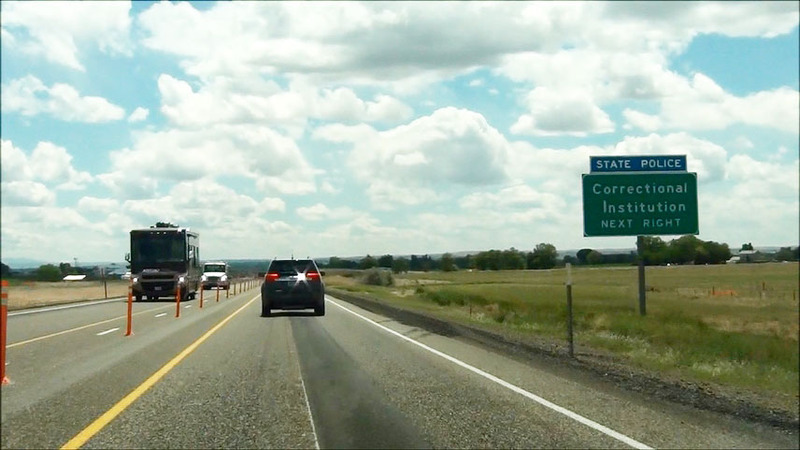 Interstate 84 East shield located near mile marker 181. (Photo taken 5/22/13). Speed limit signs near mile marker 181. 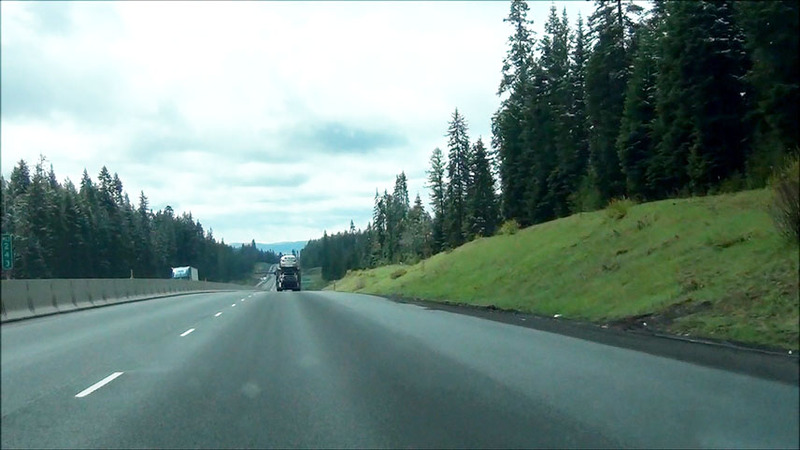 The speed limit on most rural stretches of Interstate in Oregon is 65 mph for cars and 55 mph for trucks. 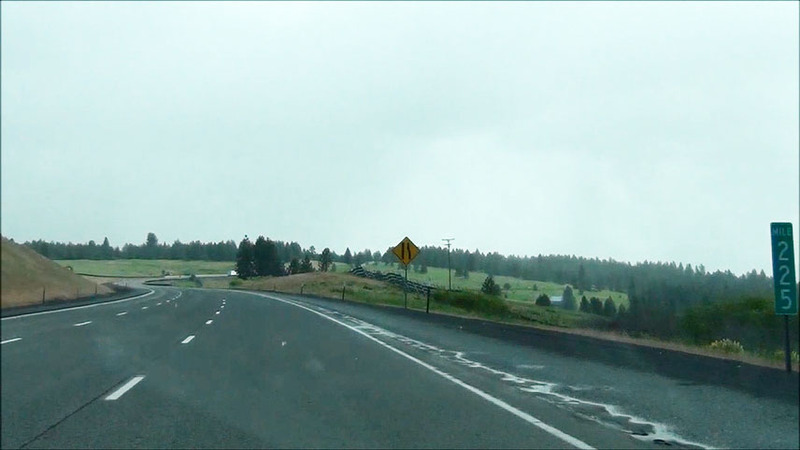 The style of these speed limit signs, with the word 'limit' omitted, is unique to Oregon road signage. (Photo taken 5/22/13). Mileage sign located near mile marker 181. 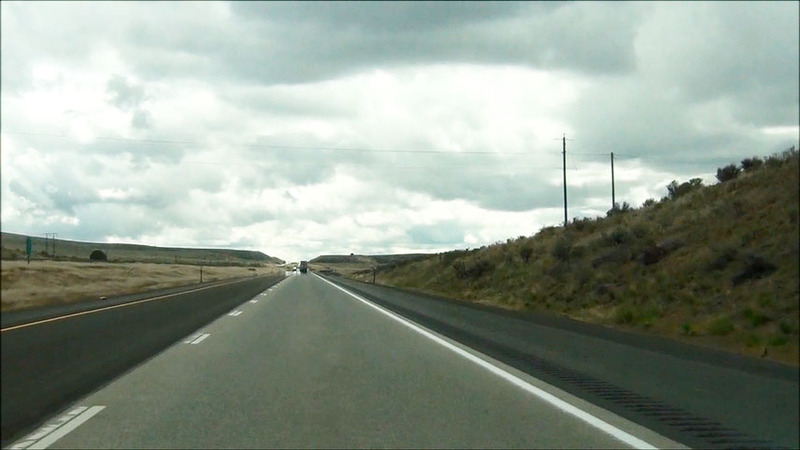 It's 9 miles to Hermiston, 29 miles to Pendleton, and 78 miles to La Grande. (Photo taken 5/22/13). 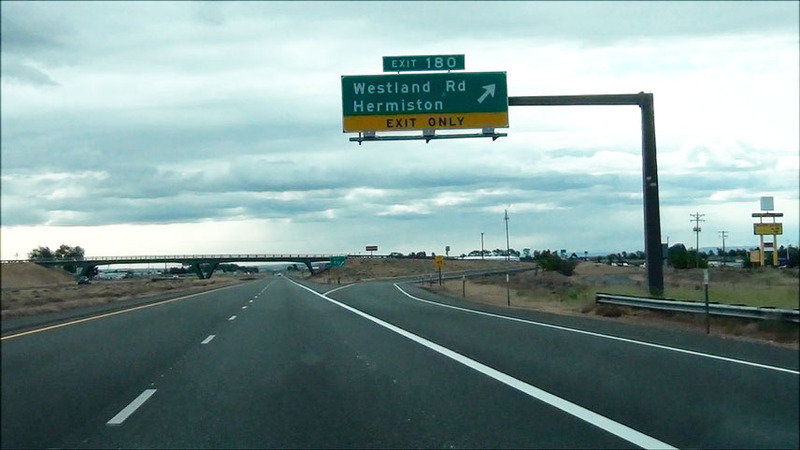 Interstate 84 East at Exit 182: OR 207 - Hermiston / Lexington (Photo taken 5/22/13). 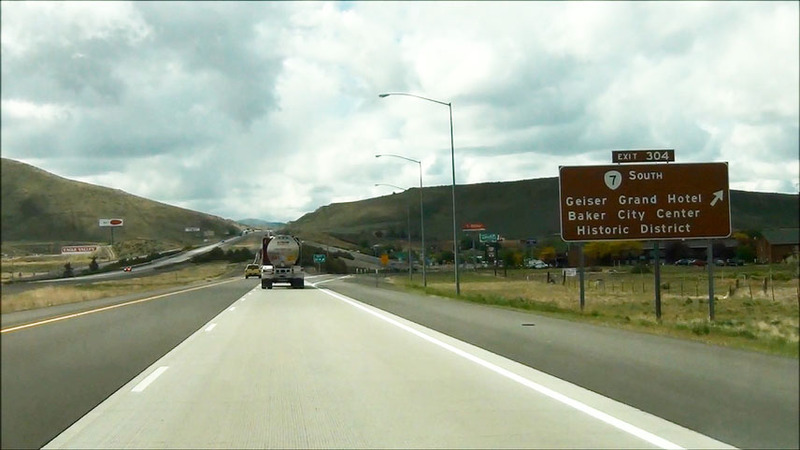 Interstate 84 East at the Rest Area located near mile marker 186.5. (Photo taken 5/22/13). Take Exit 188 to City of Echo National Historic Sites. (Photo taken 5/22/13). 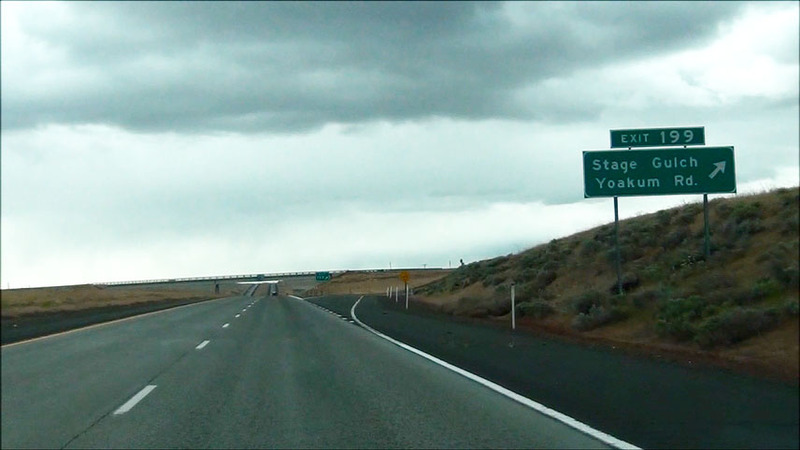 Interstate 84 East at Exit 188: US 395 North - Stanfield / Echo (Photo taken 5/22/13). 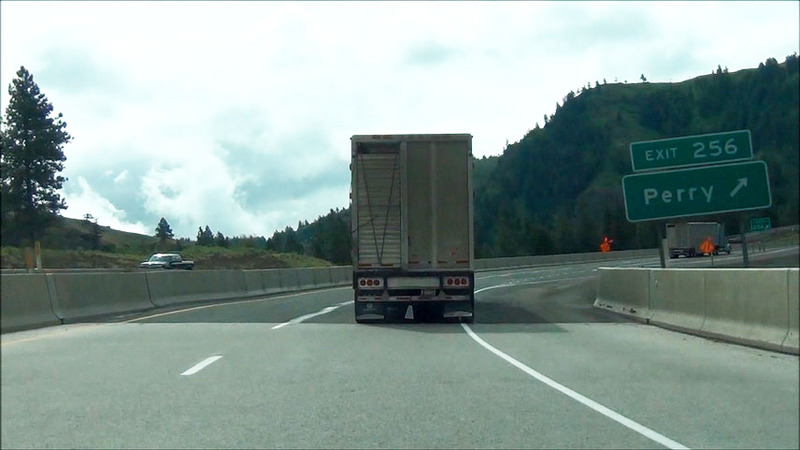 Interstate 84 East at Exit 193: Echo Rd (Photo taken 5/22/13). 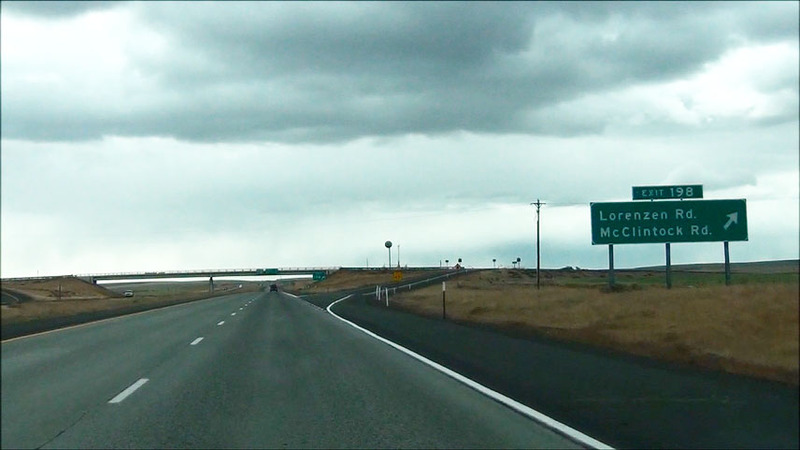 Interstate 84 East at Exit 198: Lorenzen Rd / McClintock Rd (Photo taken 5/22/13). 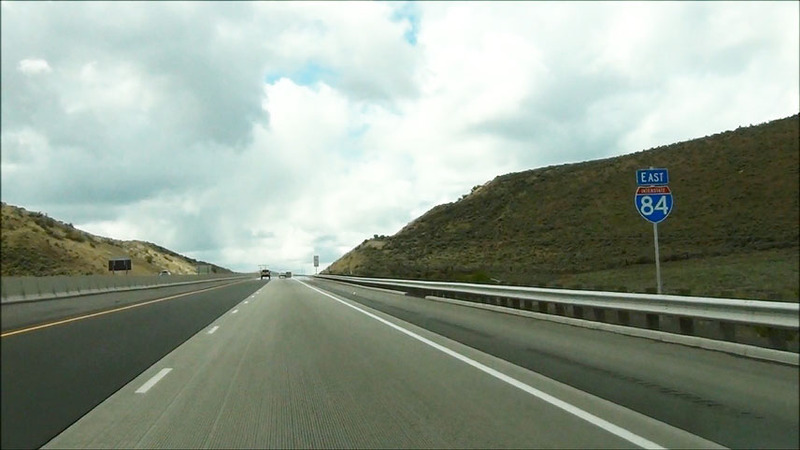 Interstate 84 East at Exit 199: Stage Gulch / Yoakum Rd (Photo taken 5/22/13). 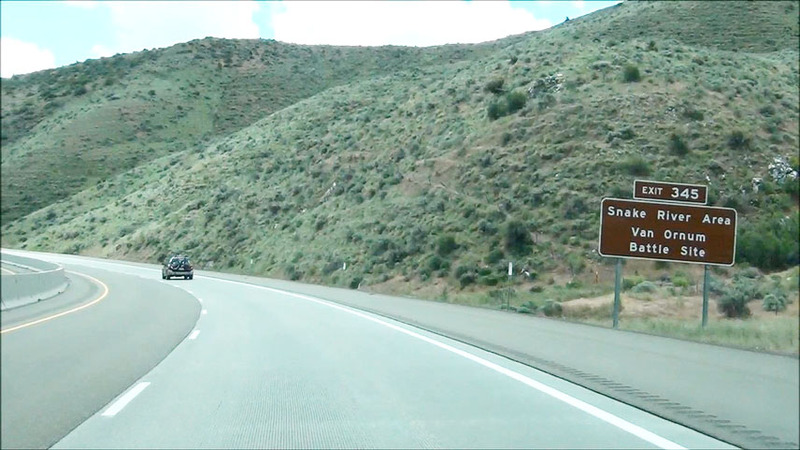 Take Exit 202 to Pendleton Airport and Stage Gulch. (Photo taken 5/22/13). Interstate 84 East at Exit 202: Barnhart Rd / Airport Rd (Photo taken 5/22/13). 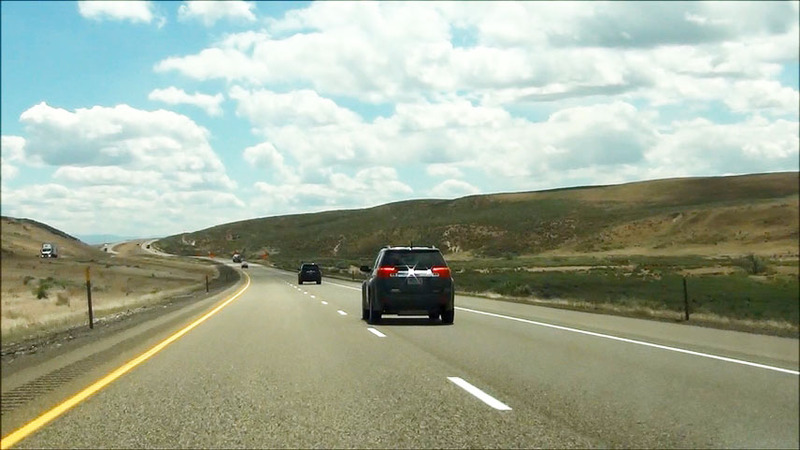 Take Exit 207 to Blue Mountain Community College as well as Pendleton Round-Up & Happy Canyon Hall of Fame. (Photo taken 5/22/13). 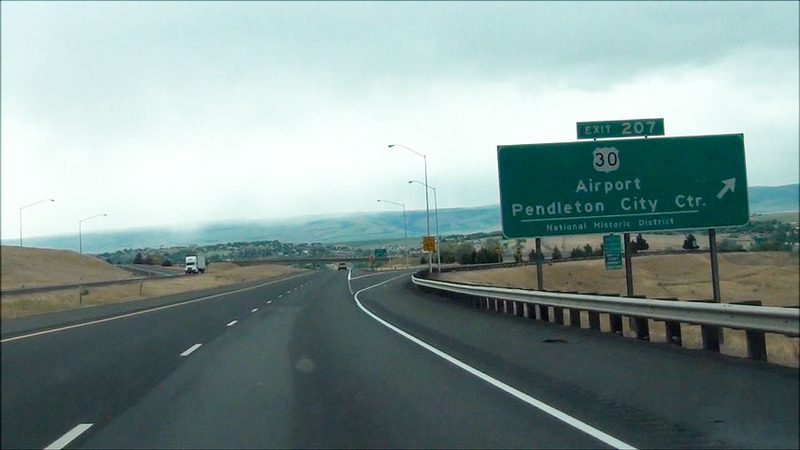 Interstate 84 East at Exit 207: US 30 - Airport / Pendleton City Center (Photo taken 5/22/13). 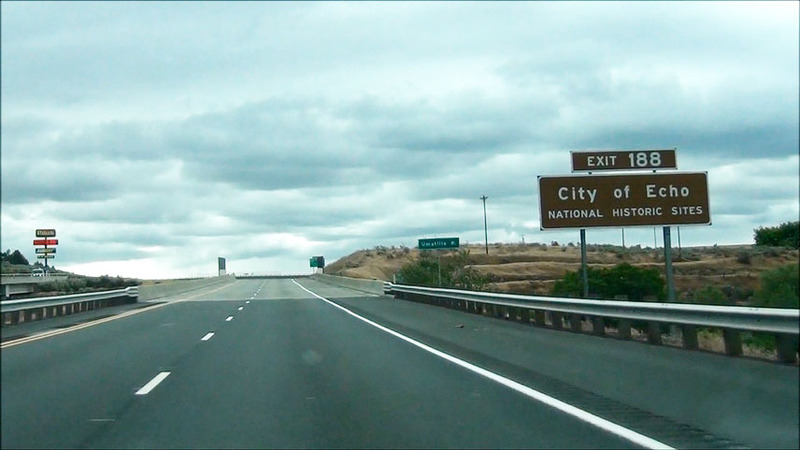 Take the next exit (Exit 209) to Pilot Rock and Ukiah. (Photo taken 5/22/13). 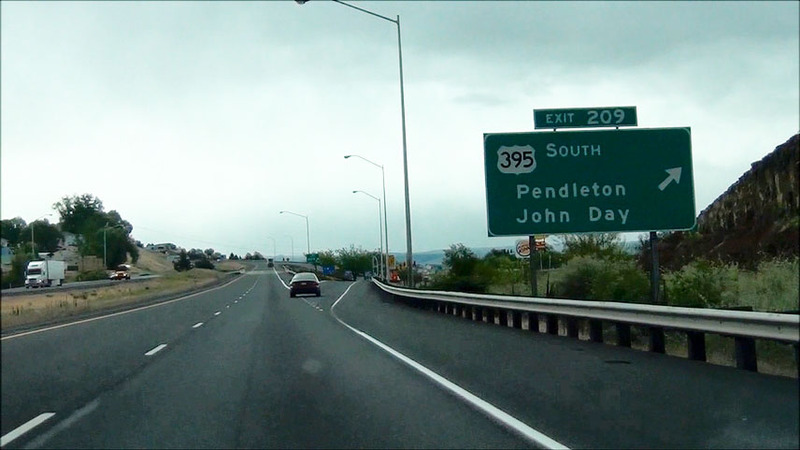 Interstate 84 East at Exit 209: US 395 South - Pendleton / John Day (Photo taken 5/22/13). 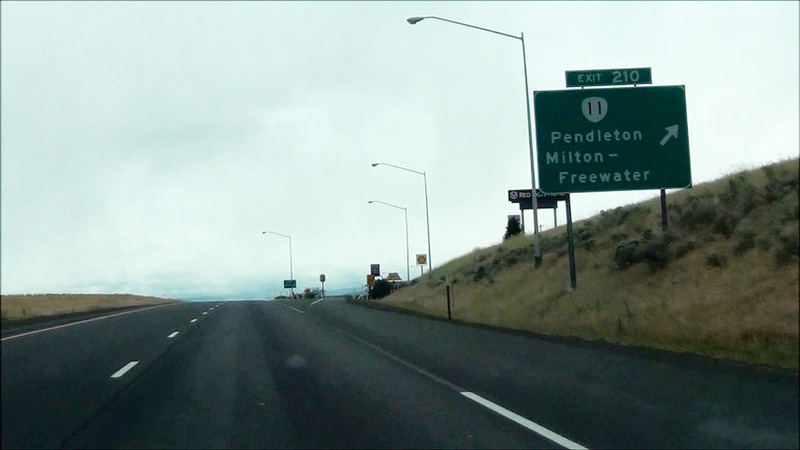 Interstate 84 East at Exit 210: OR 11 - Pendleton / Milton - Freewater (Photo taken 5/22/13). 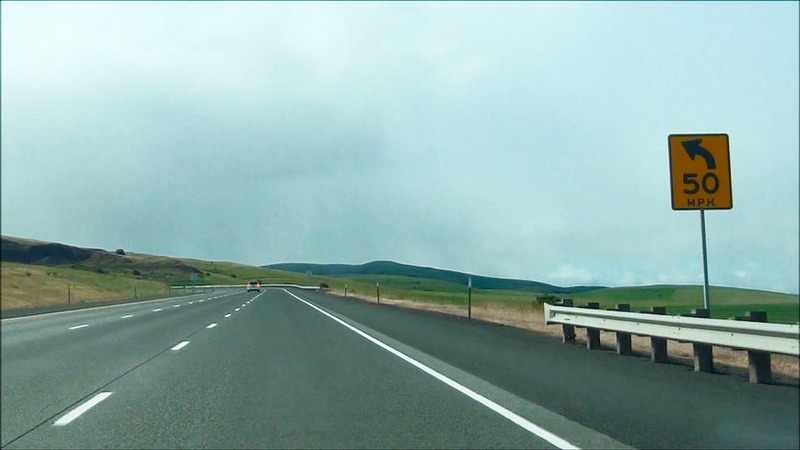 Interstate 84 East: Road view from mile marker 213. The mountain in the background is Cabbage Hill, which we will be climbing about 5 miles ahead. (Photo taken 5/22/13). 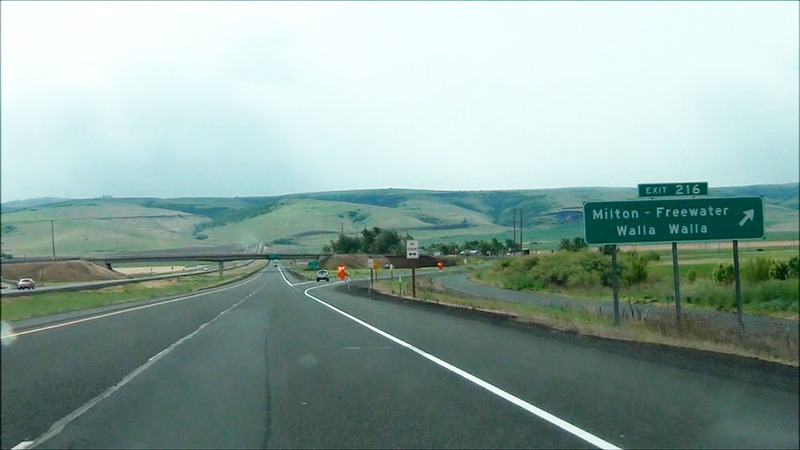 Interstate 84 East at Exit 216: Milton - Freewater / Walla Walla (Photo taken 5/22/13). 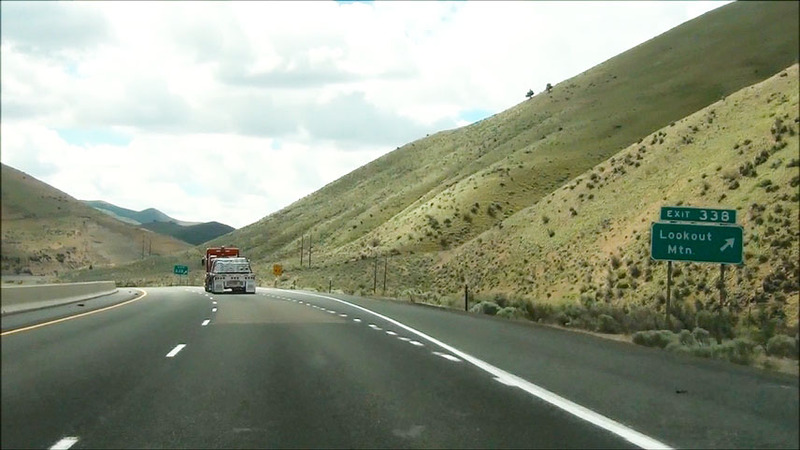 Interstate 84 East at the Chain-Up Area located near mile marker 216. Trucks will oftentimes need to install tire chains here in the winter to make it over Cabbage Hill. (Photo taken 5/22/13). 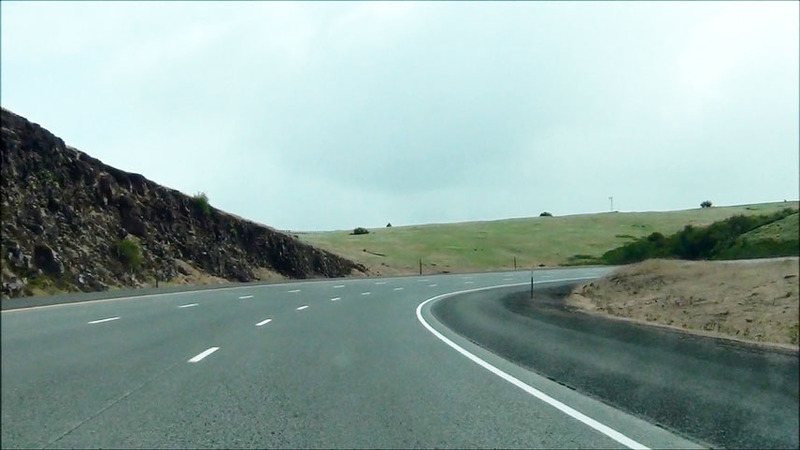 Interstate 84 East: Road view approaching Cabbage Hill near mile marker 217. (Photo taken 5/22/13). 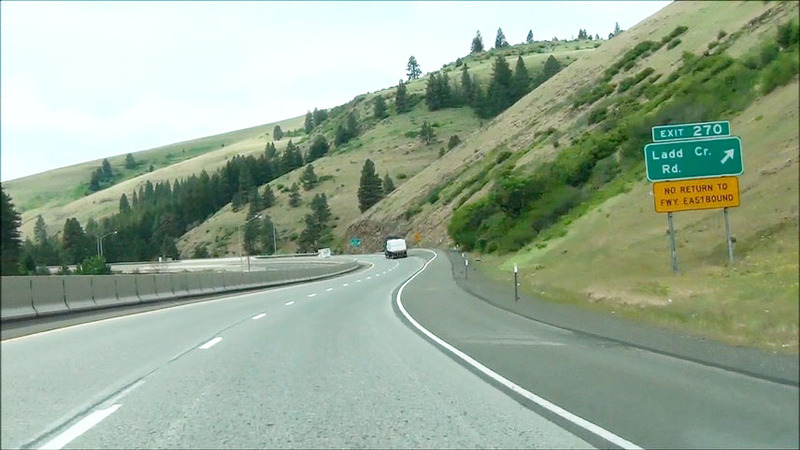 Interstate 84 East: Road view from mile marker 218, as you begin the climb up Cabbage Hill. We have a long, winding climb ahead of us folks! (Photo taken 5/22/13). Warning sign near mile marker 218.5 as we begin the climb. 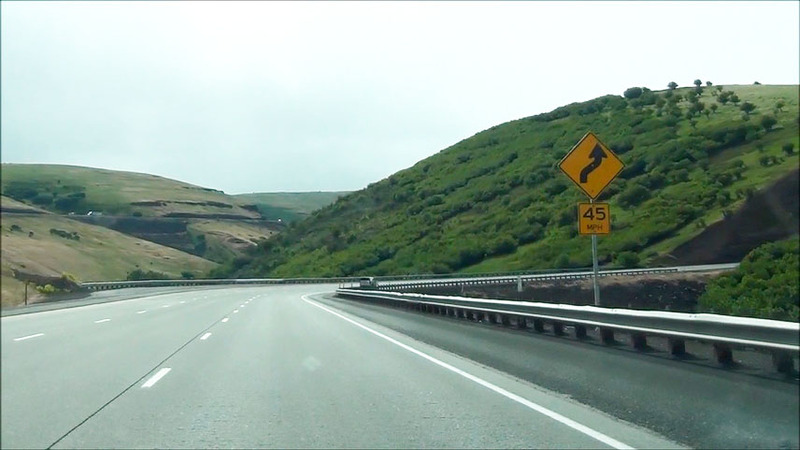 This sign warns of the first of several sharp curves on the way up Cabbage Hill just ahead. Recommended speed is 50 mph. (Photo taken 5/22/13). 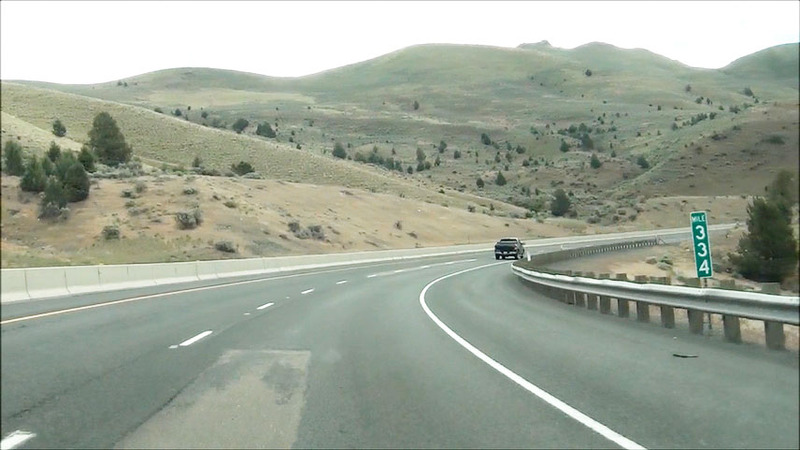 Interstate 84 East: Road view from near mile marker 219, as you prepare for more winding curves ahead. (Photo taken 5/22/13). 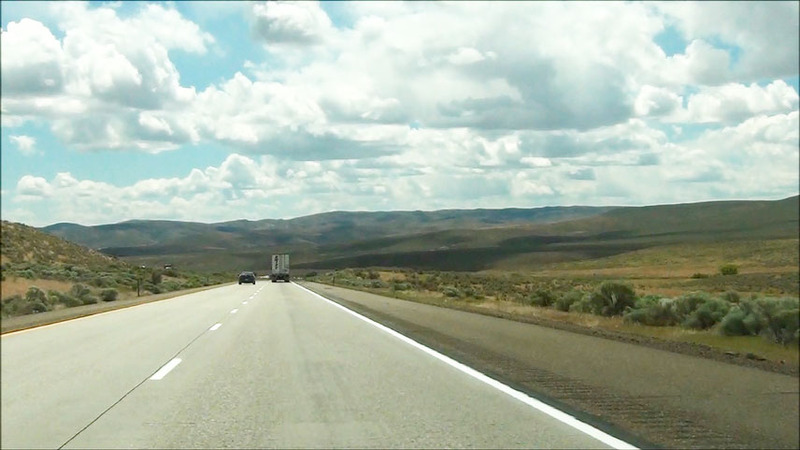 Interstate 84 East: Road view from near mile marker 220. The steep climb continues. (Photo taken 5/22/13). 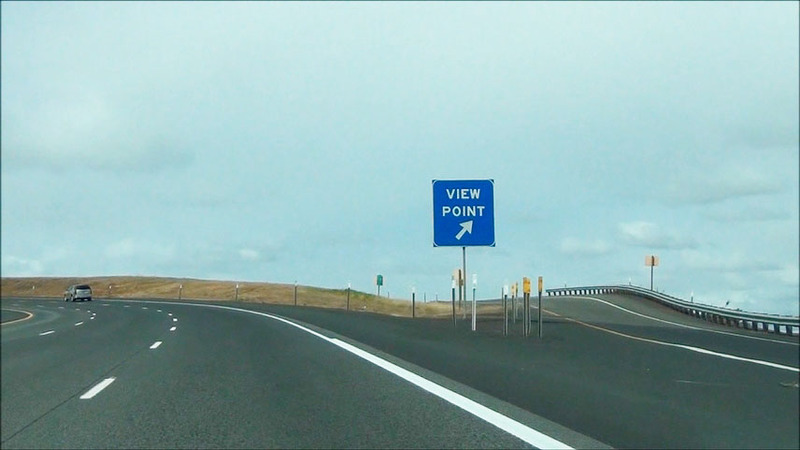 Interstate 84 East at the View Point / Chain-Up Area located near mile marker 221. (Photo taken 5/22/13). Interstate 84 East approaching more sharp 45 mph curves near mile marker 222. (Photo taken 5/22/13). 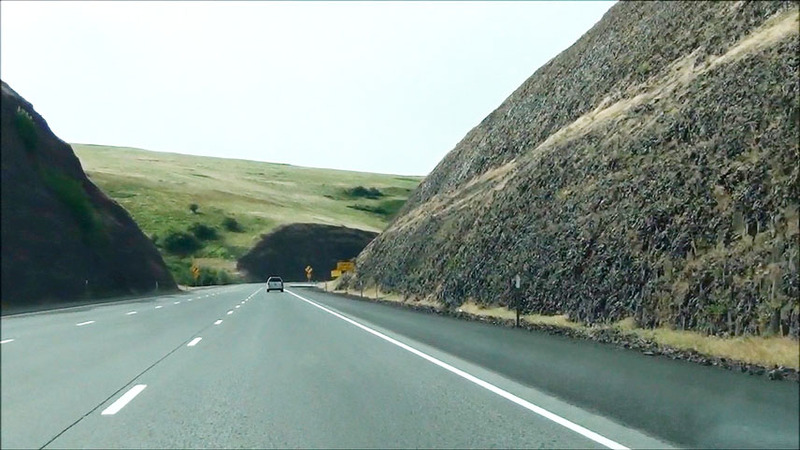 Interstate 84 East: Road view from near mile marker 223. Getting closer to the top now...... (Photo taken 5/22/13). 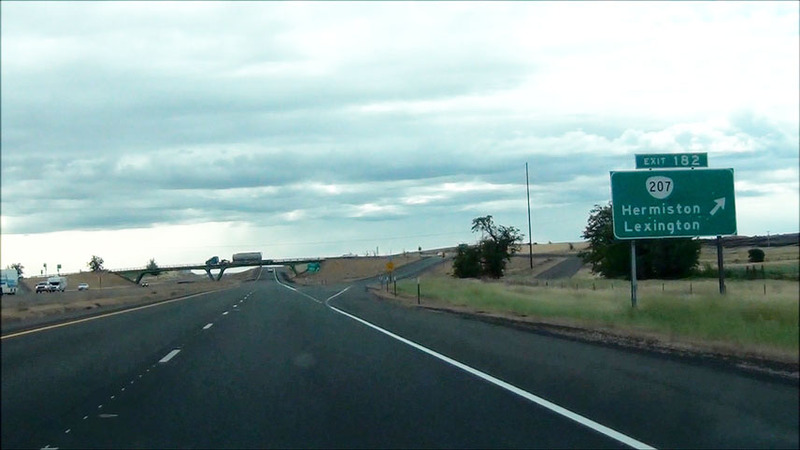 Interstate 84 East at Exit 224: Poverty Flat Rd / Old Emigrant Hill Rd (Photo taken 5/22/13). 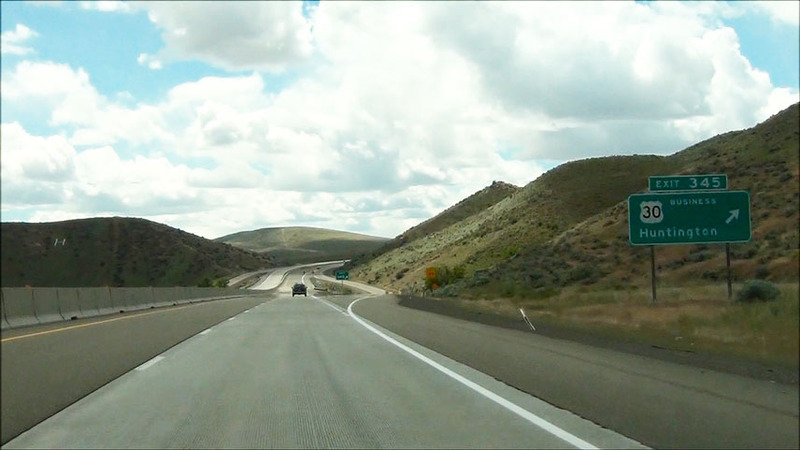 Interstate 84 East: Road view from mile marker 225. 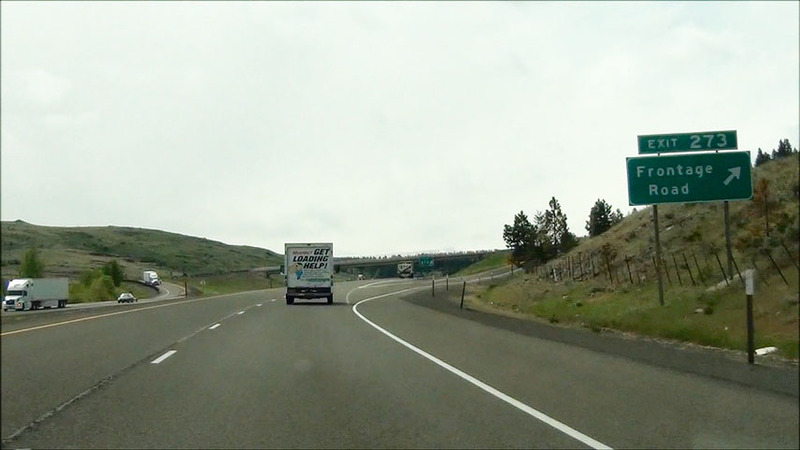 You can see the warning sign just ahead, showing that the right lane ends. 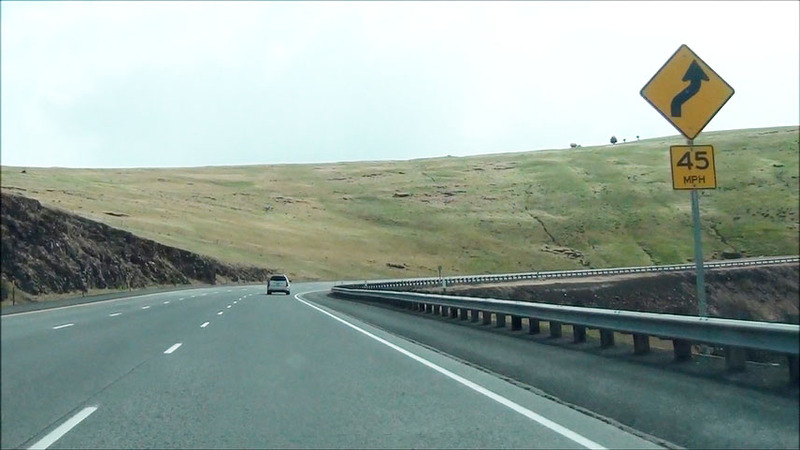 Since the truck climbing lane is coming to an end, that means we're nearly to the top of Cabbage Hill. (Photo taken 5/22/13). Mileage sign located near mile marker 225.5. 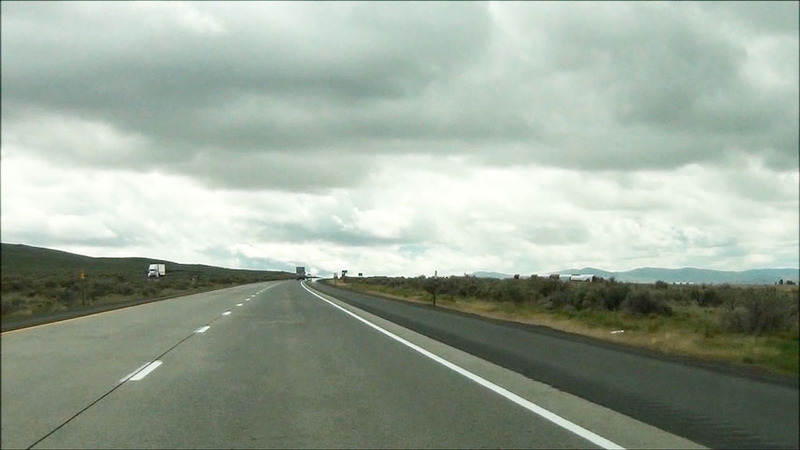 It's 4 miles to the next Rest Area, 37 miles to La Grande, and 81 miles to Baker City. Notice the snowflakes starting to fall in this picture. This was taken in late May 2013. That shows you just how much a quick change in elevation out here can have an impact on temperatures! (Photo taken 5/22/13). 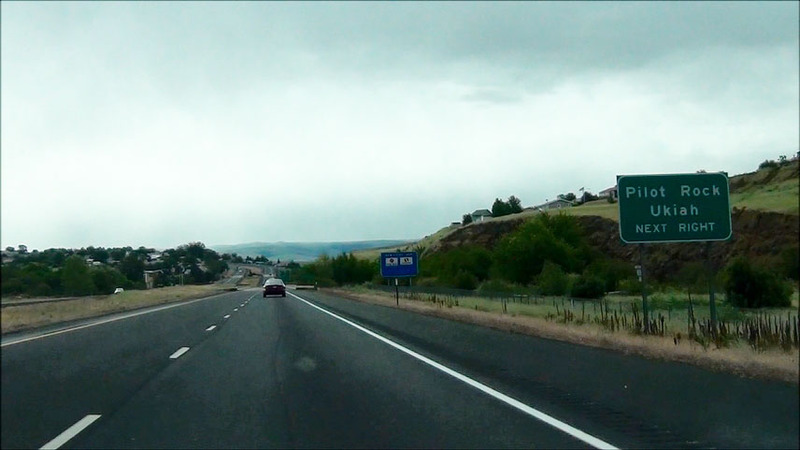 Interstate 84 East at another Chain-Up Area located near mile marker 226. (Photo taken 5/22/13). 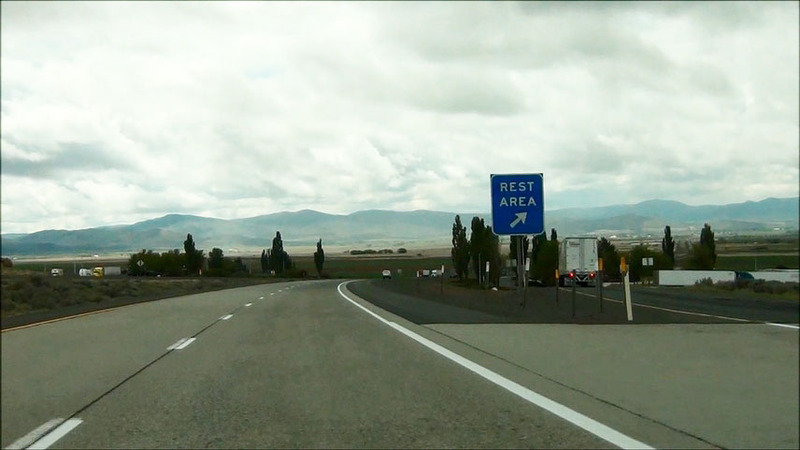 Interstate 84 East at Exit 228: Deadman Pass / Rest Area (Photo taken 5/22/13). Take Exit 234 to Meacham. (Photo taken 5/22/13). 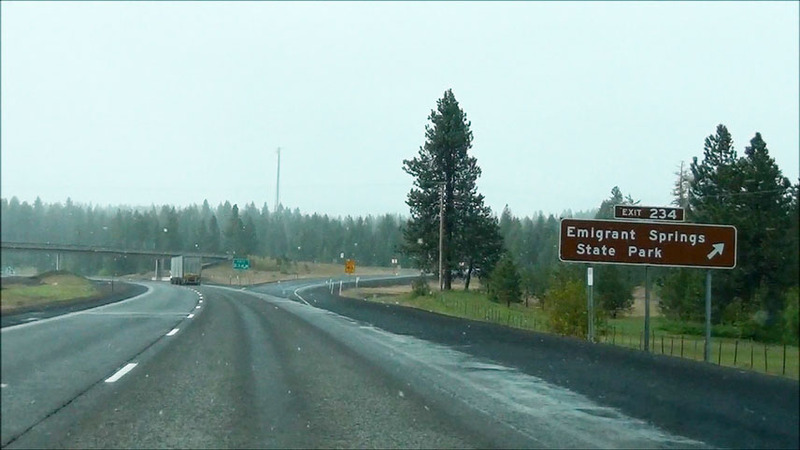 Interstate 84 East at Exit 234: Emigrant Springs State Park. Now you can really see that late May snow falling on top of this mountain! (Photo taken 5/22/13). 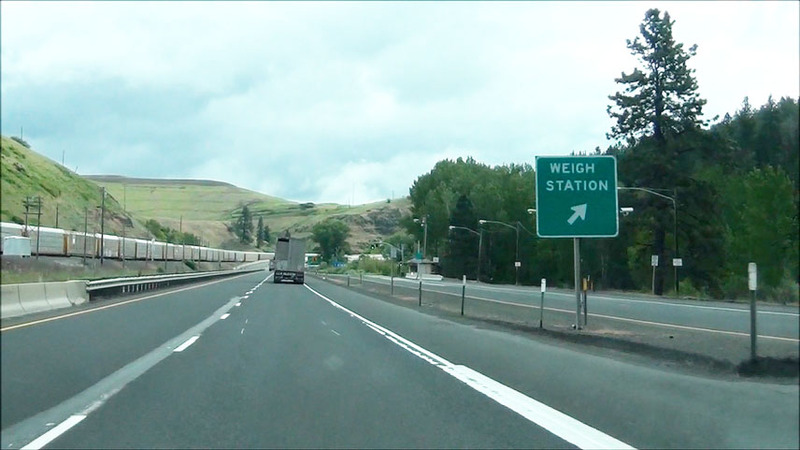 Interstate 84 East at Exit 238: Meachem / Kamela (Photo taken 5/22/13). 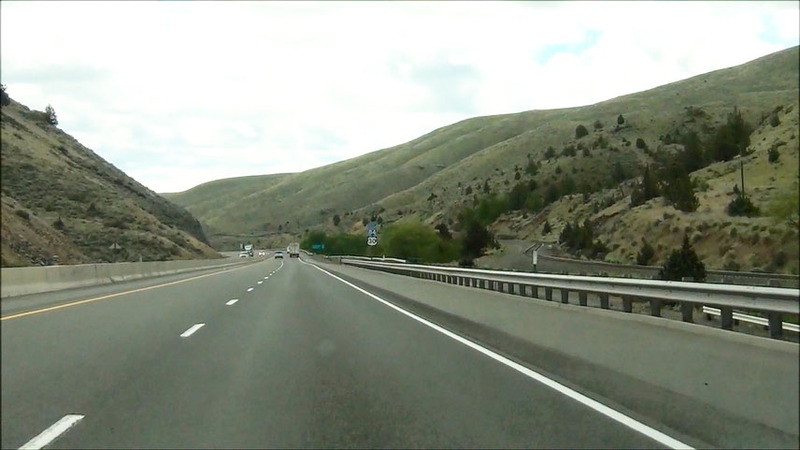 Interstate 84 East: Road view from mile marker 243. (Photo taken 5/22/13). 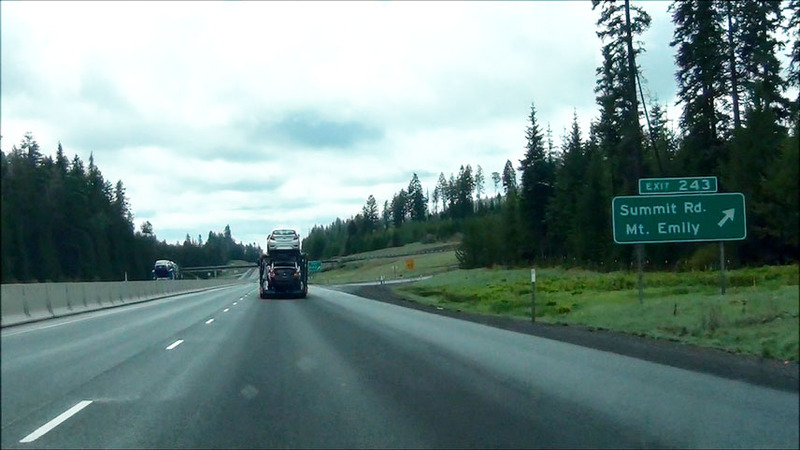 Interstate 84 East at Exit 243: Summit Rd / Mt. Emily (Photo taken 5/22/13). 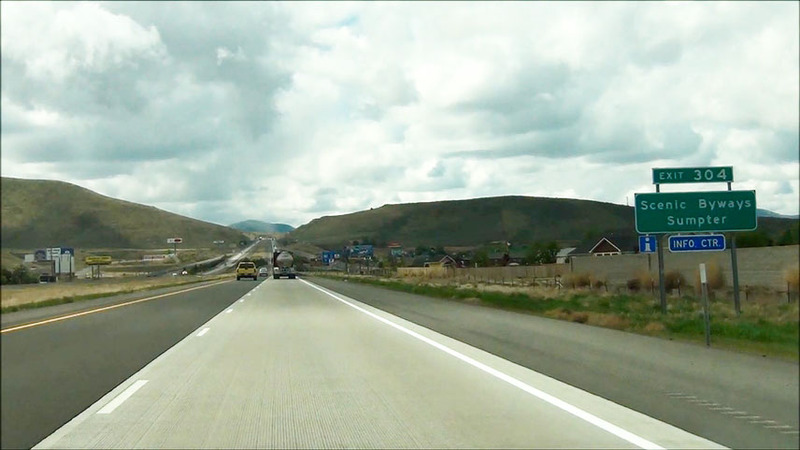 Interstate 84 East at Exit 248: Spring Creek Rd (Photo taken 5/22/13). 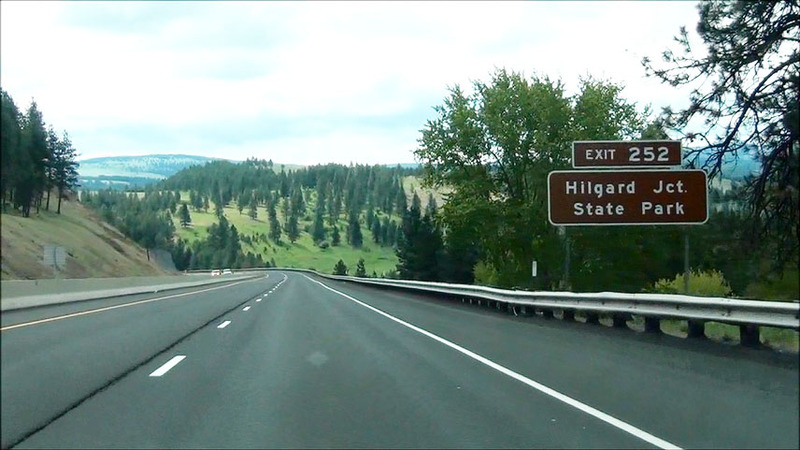 Take Exit 252 to Hilgard Junction State Park. (Photo taken 5/22/13). 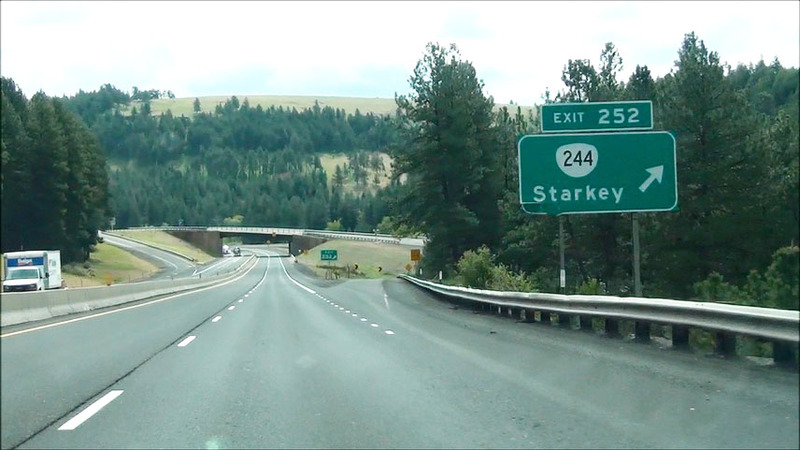 Interstate 84 East at Exit 252: OR 244 - Starkey (Photo taken 5/22/13). 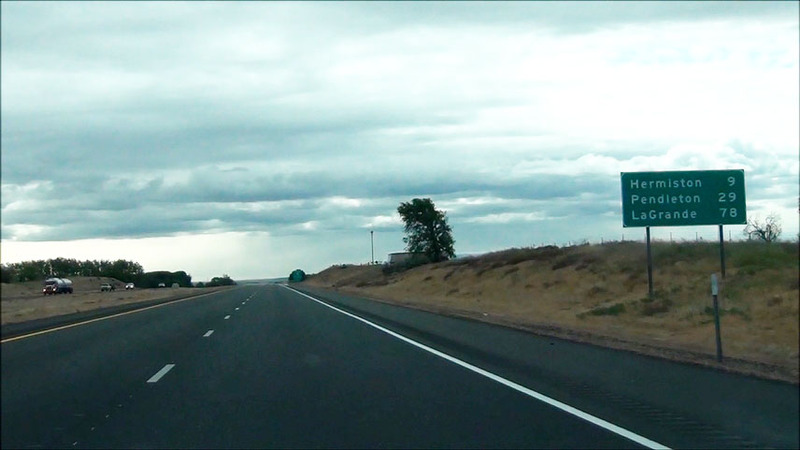 Interstate 84 East shield located near mile marker 253. Oh, and the view is pretty nice too. (Photo taken 5/22/13). 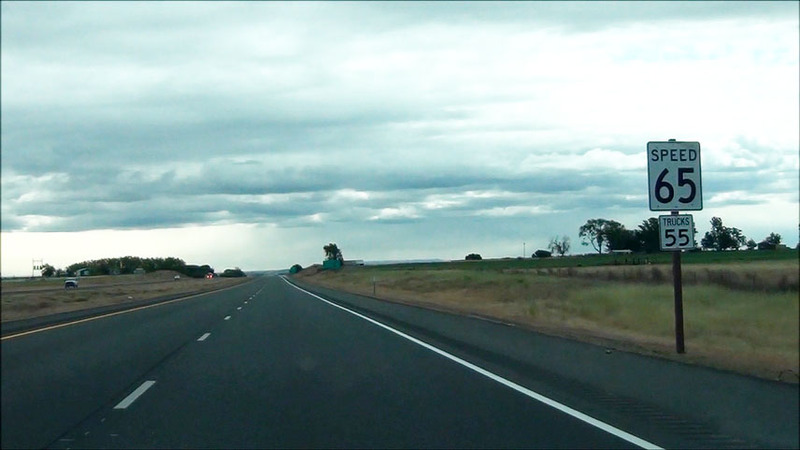 Interstate 84 East: Road view from near mile marker 254. (Photo taken 5/22/13). 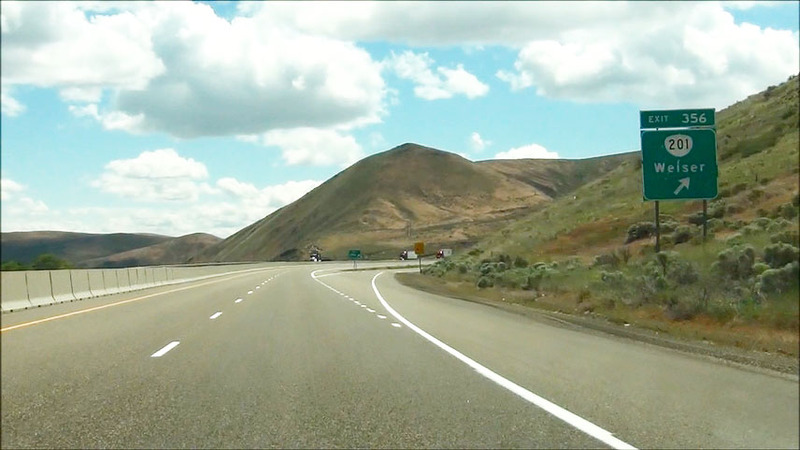 Interstate 84 East: Road view from mile marker 255. (Photo taken 5/22/13). Take Exit 256 to Historic Arch Bridge Viewpoint. (Photo taken 5/22/13). 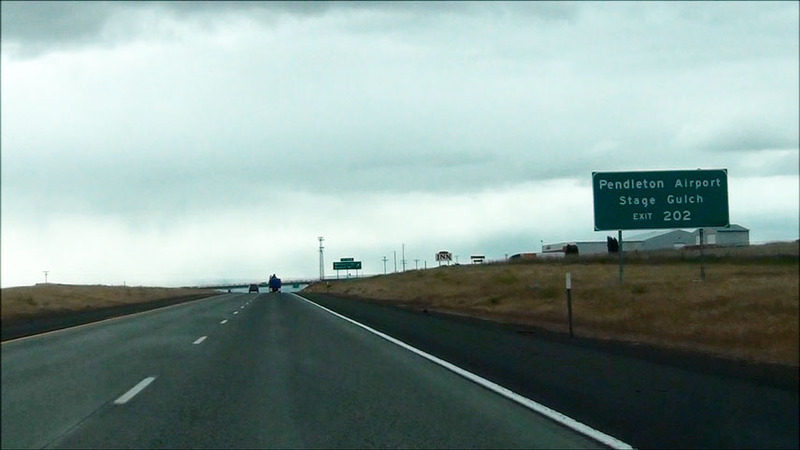 Interstate 84 East at Exit 256: Perry (Photo taken 5/22/13). 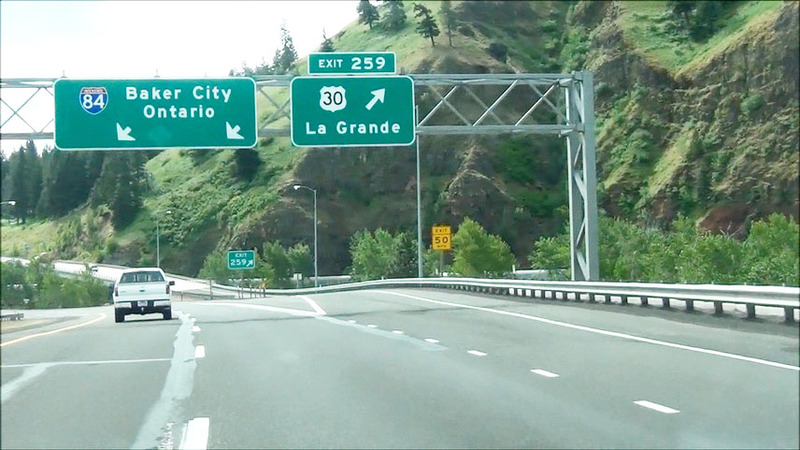 Take any of the next 3 exits to La Grande. (Photo taken 5/22/13). 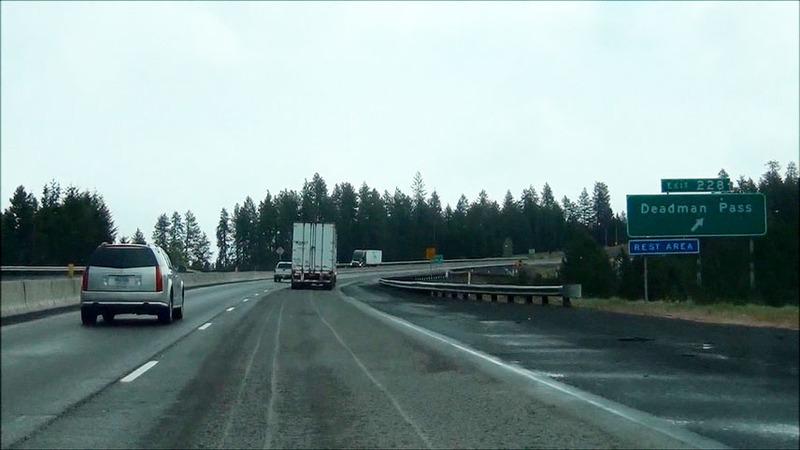 Interstate 84 East at the Weigh Station located near mile marker 258.5. (Photo taken 5/22/13). 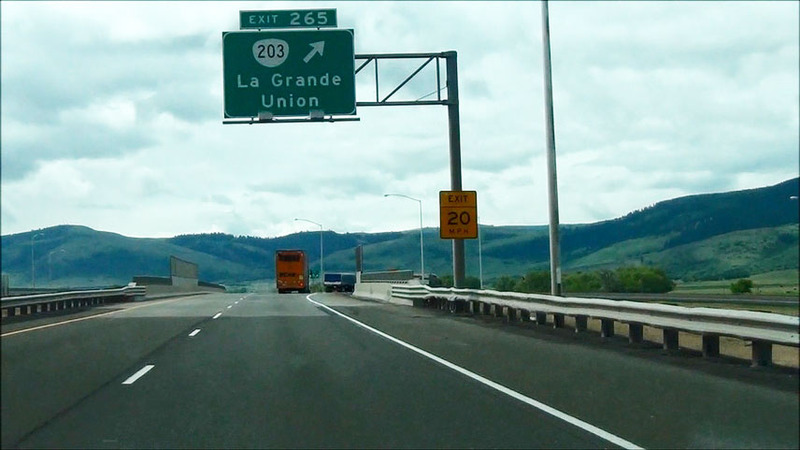 Sign showing the route that US 30 takes to the La Grande City Center before joining back up with Interstate 84. (Photo taken 5/22/13). 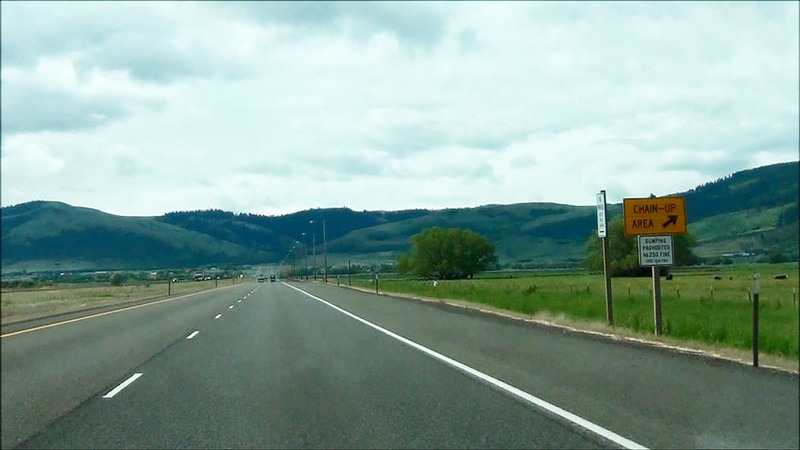 Interstate 84 East at Exit 259: US 30 - La Grande (Photo taken 5/22/13). 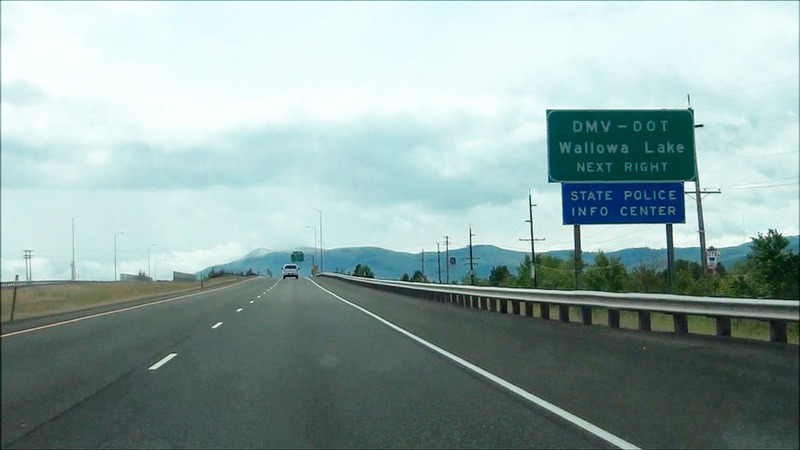 Take the next exit (Exit 261) to Wallowa Lake. (Photo taken 5/22/13). 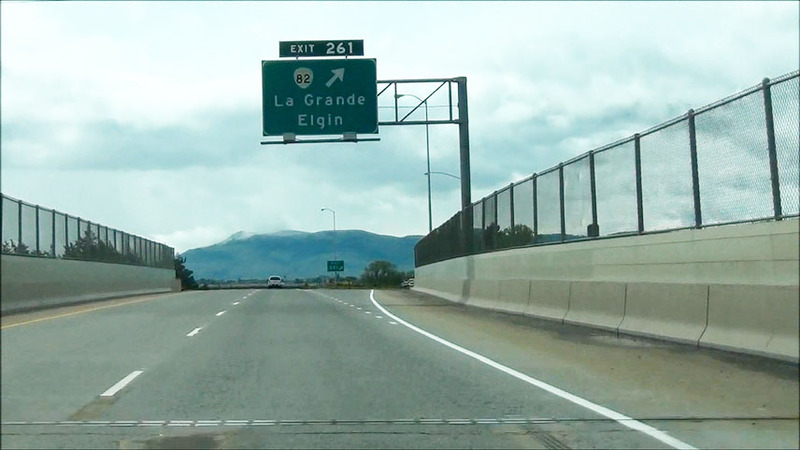 Interstate 84 East at Exit 261: OR 82 - La Grande / Elgin (Photo taken 5/22/13). Take Exit 265 to Hot Lake Springs and Union County Museum. (Photo taken 5/22/13). 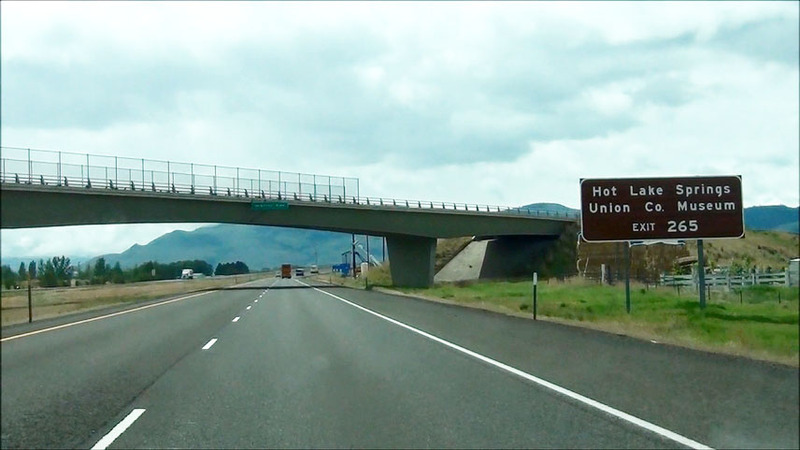 Interstate 84 East at Exit 265: OR 203 - La Grande / Union (Photo taken 5/22/13). 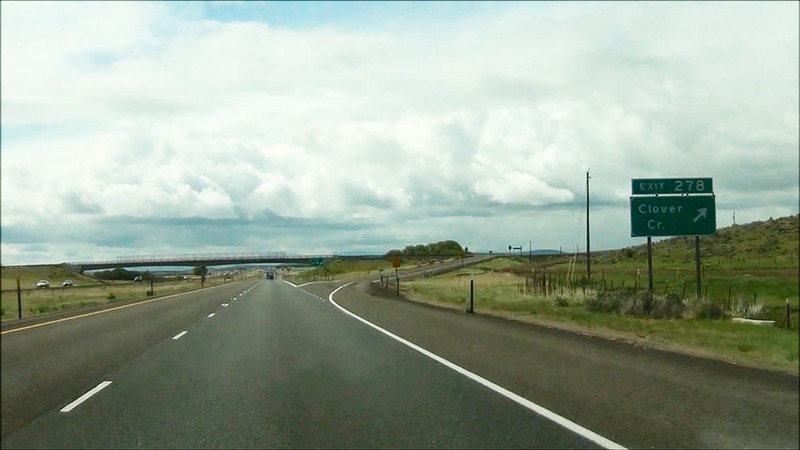 Interstate 84 East at the Chain-Up Area located near mile marker 266. (Photo taken 5/22/13). 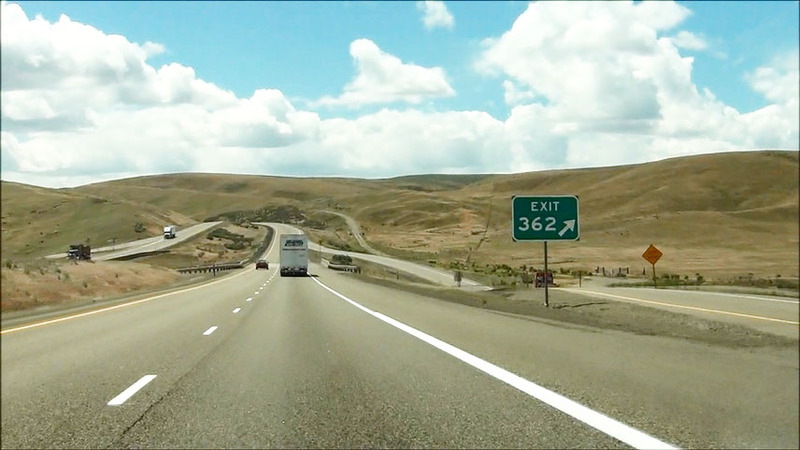 Interstate 84 East at Exit 268: Foothill Rd (Photo taken 5/22/13). 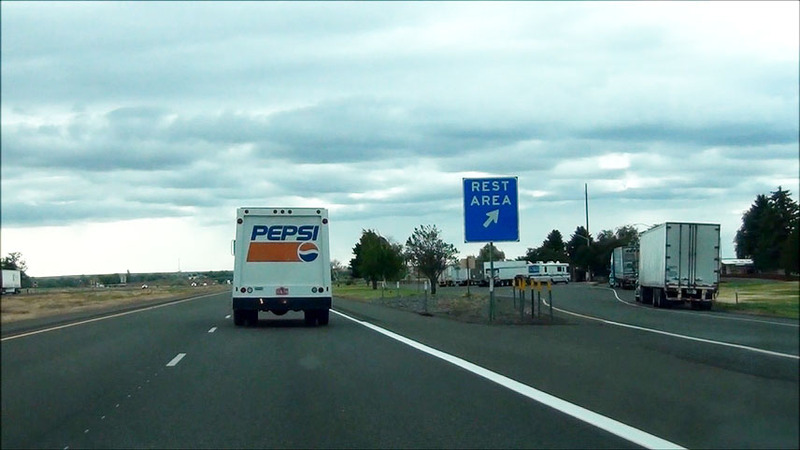 Interstate 84 East at the Rest Area located near mile marker 269. (Photo taken 5/22/13). 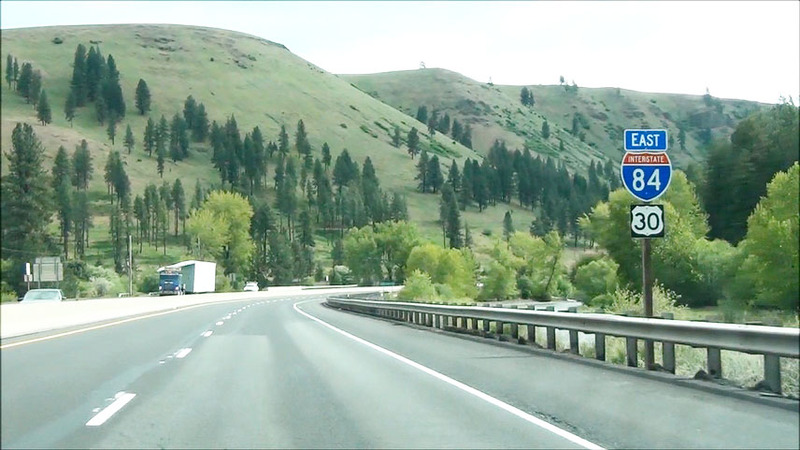 Interstate 84 East at Exit 270: Ladd Creek Rd (Photo taken 5/22/13). 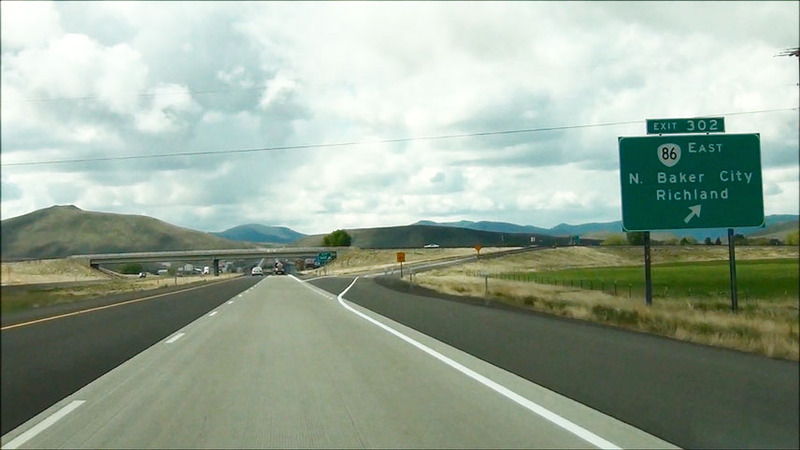 Interstate 84 East at Exit 273: Frontage Road (Photo taken 5/22/13). 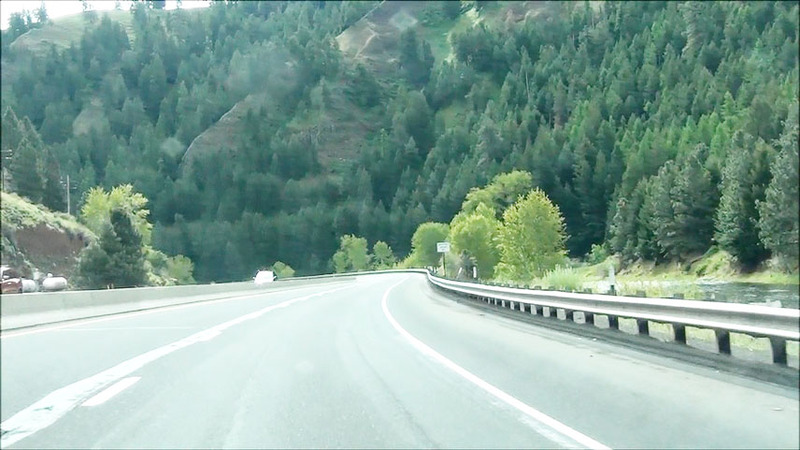 Interstate 84 East at Exit 278: Clover Creek (Photo taken 5/22/13). 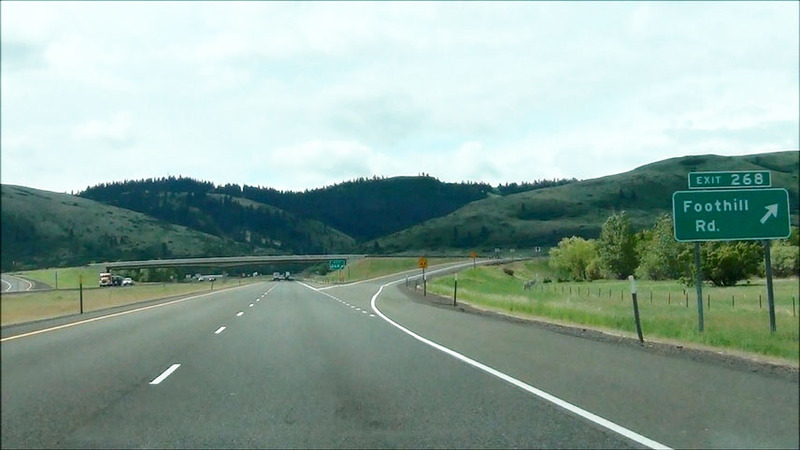 Interstate 84 East at Exit 283: Wolf Creek Lane (Photo taken 5/22/13). 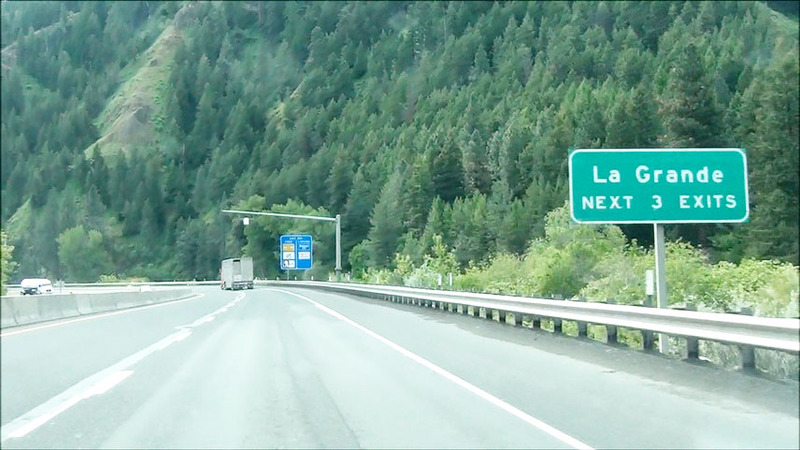 Take the next exit (Exit 285) to Anthony Lakes. (Photo taken 5/22/13). 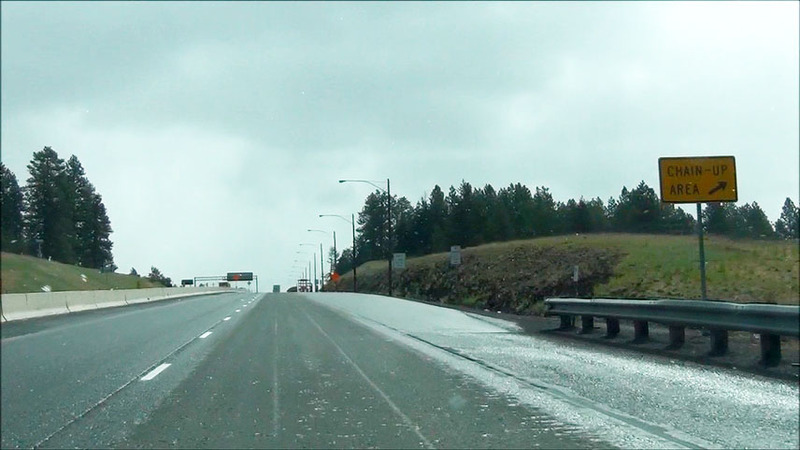 Interstate 84 East at Exit 285: US 30 / OR 237 - North Powder / Haines (Photo taken 5/22/13). 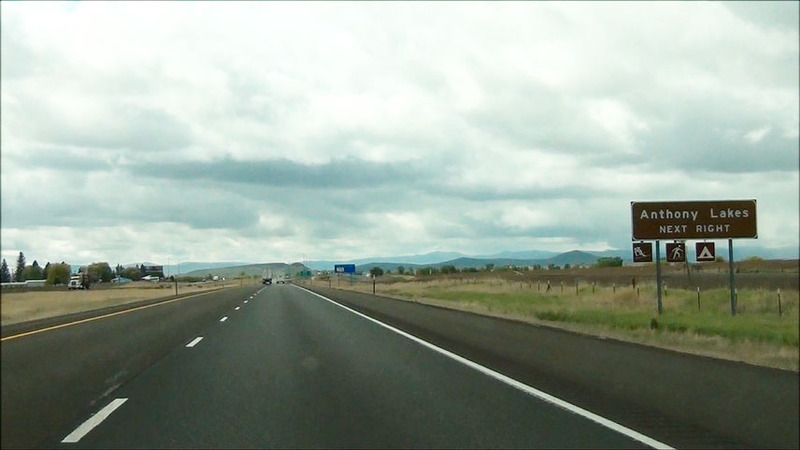 Interstate 84 East: Road view from mile marker 289. (Photo taken 5/22/13). 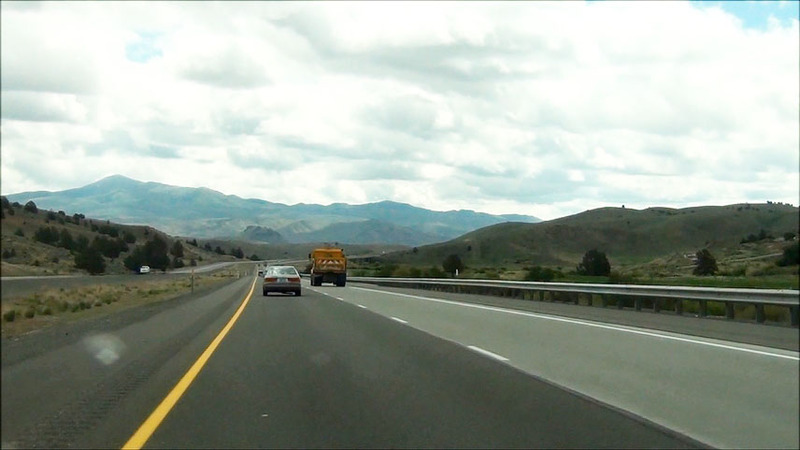 Interstate 84 East: Road view from near mile marker 292. (Photo taken 5/22/13). 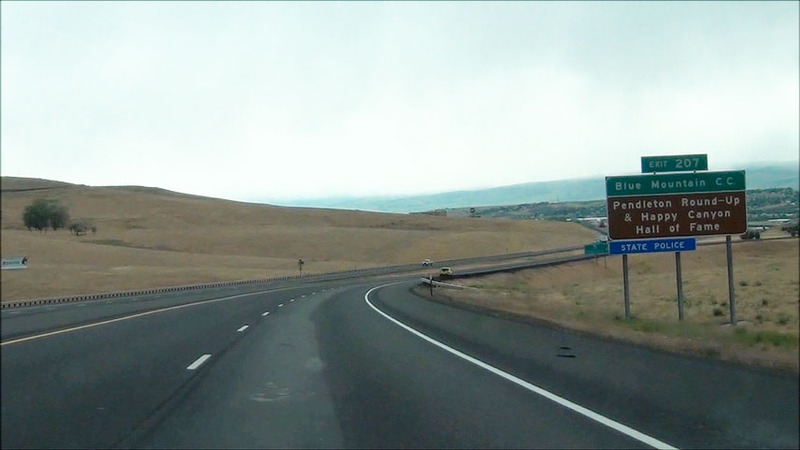 Interstate 84 East at the Rest Area located at mile marker 295. (Photo taken 5/22/13). 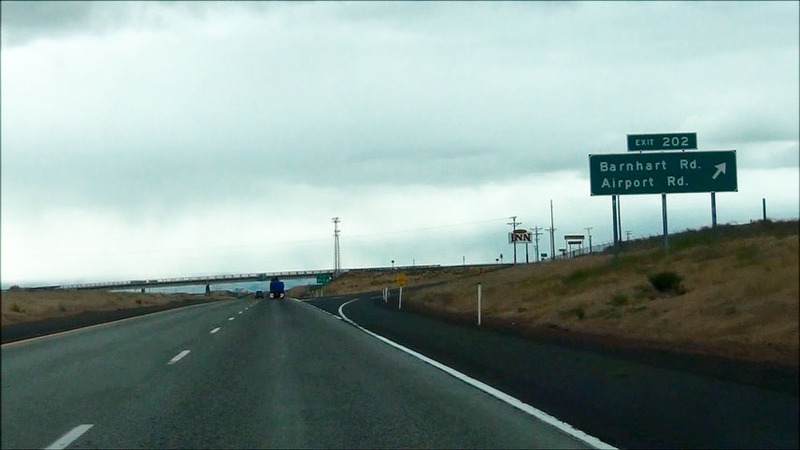 Interstate 84 East at Exit 298: OR 203 - Baker City Airport / Medical Springs (Photo taken 5/22/13). 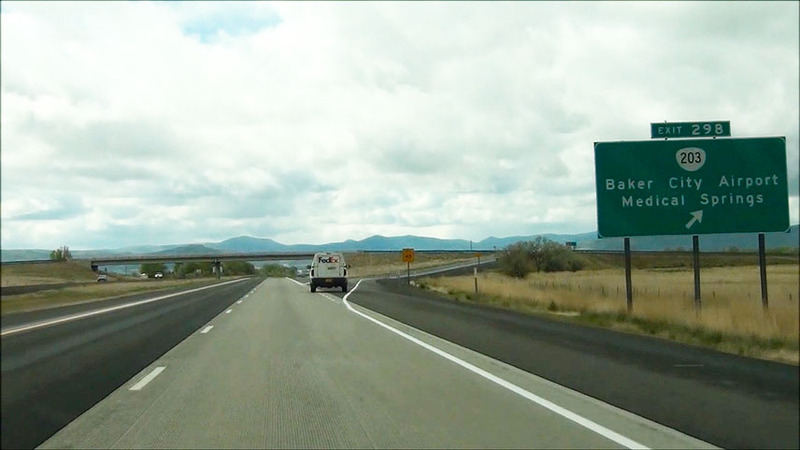 Take any of the next 3 exits to Baker City. (Photo taken 5/22/13). 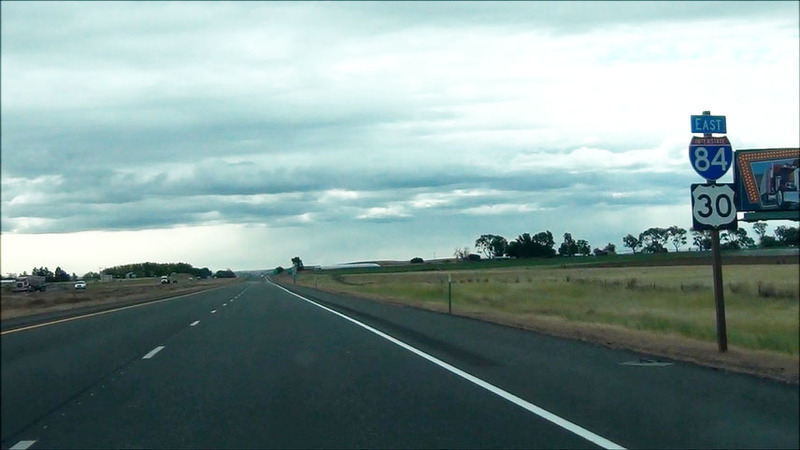 Interstate 84 East at another Chain-Up Area located near mile marker 301. (Photo taken 5/22/13). 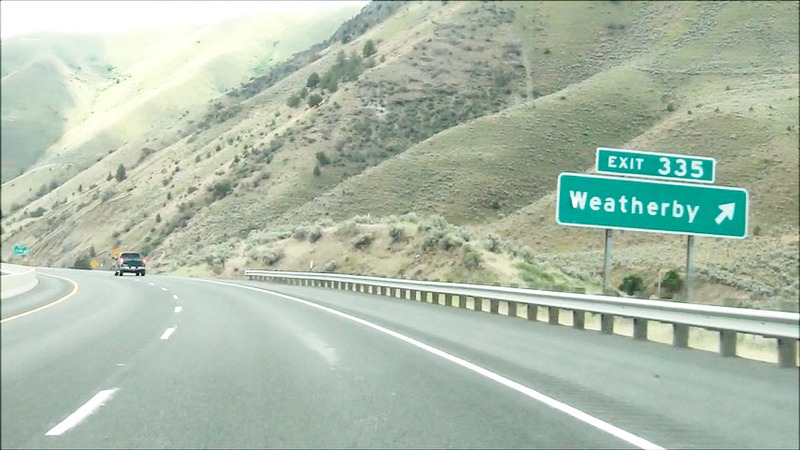 Take the next exit (Exit 302) to Oregon Trail Interpretive Center and Hells Canyon. (Photo taken 5/22/13). 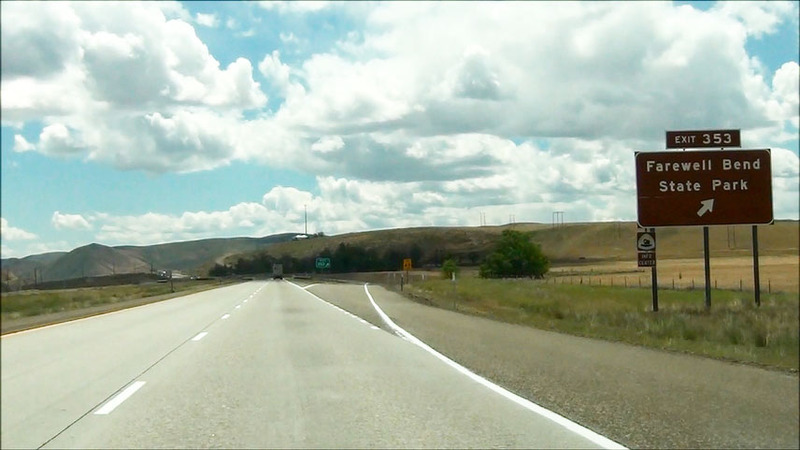 Interstate 84 East at Exit 302: OR 86 East - North Baker City / Richland (Photo taken 5/22/13). 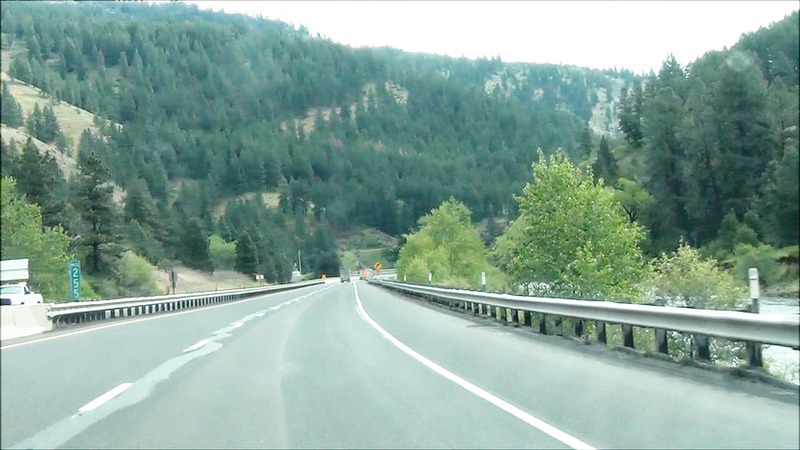 Take Exit 304 to Scenic Byways and Sumpter. (Photo taken 5/22/13). 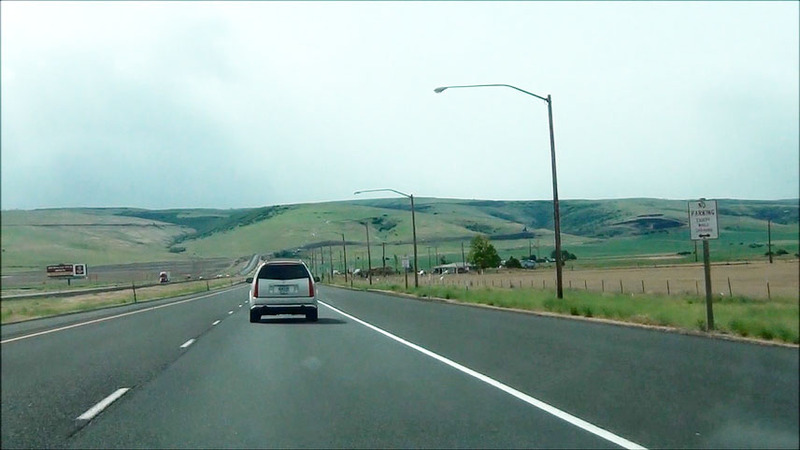 Interstate 84 East at Exit 304: OR 7 South - Geiser Grand Hotel / Baker City Center / Historic District (Photo taken 5/22/13). 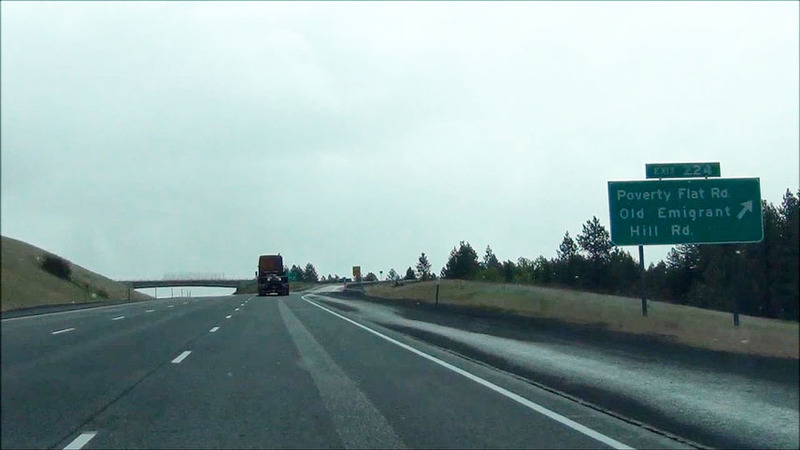 Interstate 84 East shield located near mile marker 305. (Photo taken 5/22/13). 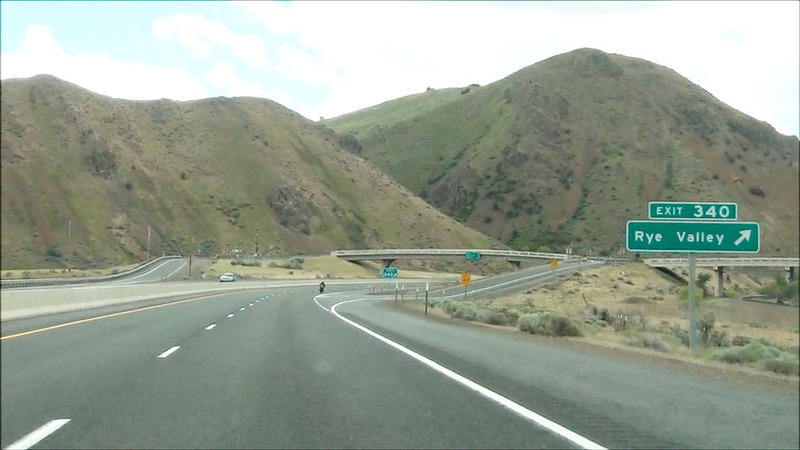 Interstate 84 East at Exit 306: US 30 West - Baker City (Photo taken 5/22/13). 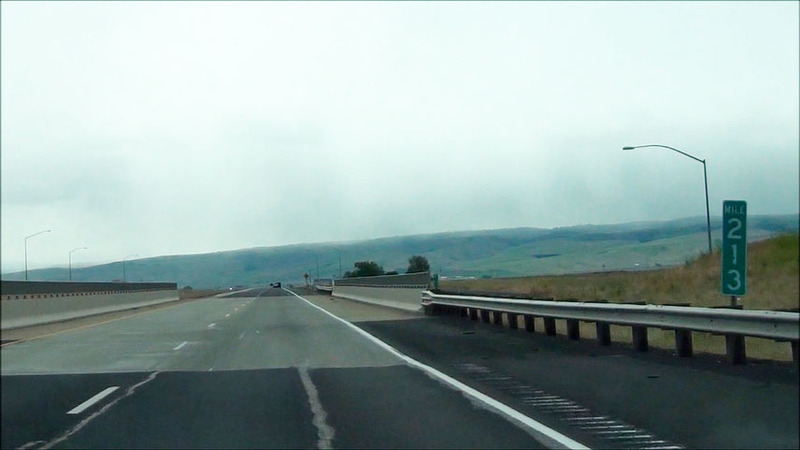 Interstate 84 East: Road view from mile marker 309. (Photo taken 5/22/13). 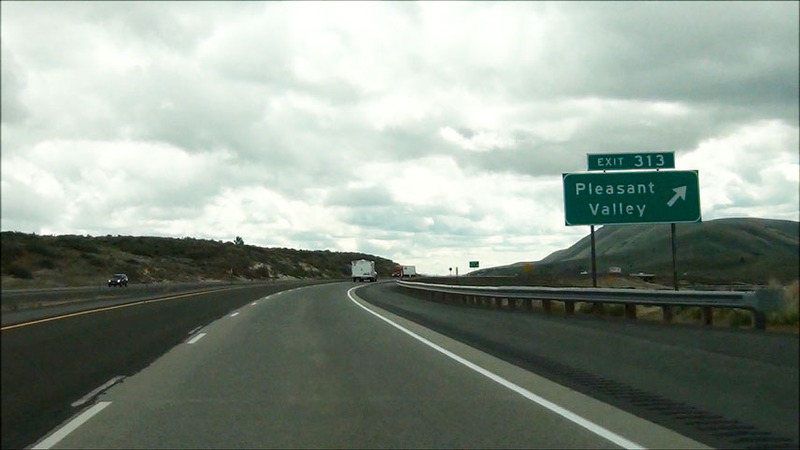 Interstate 84 East at Exit 313: Pleasant Valley (Photo taken 5/22/13). 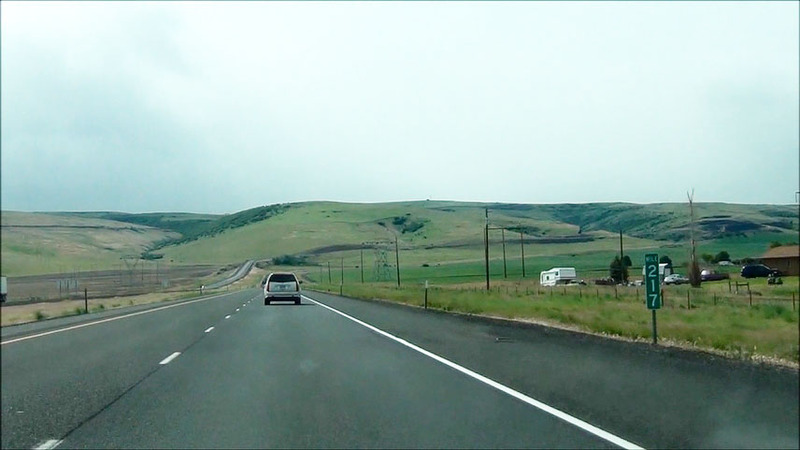 Interstate 84 East: Road view from near mile marker 317. (Photo taken 5/22/13). 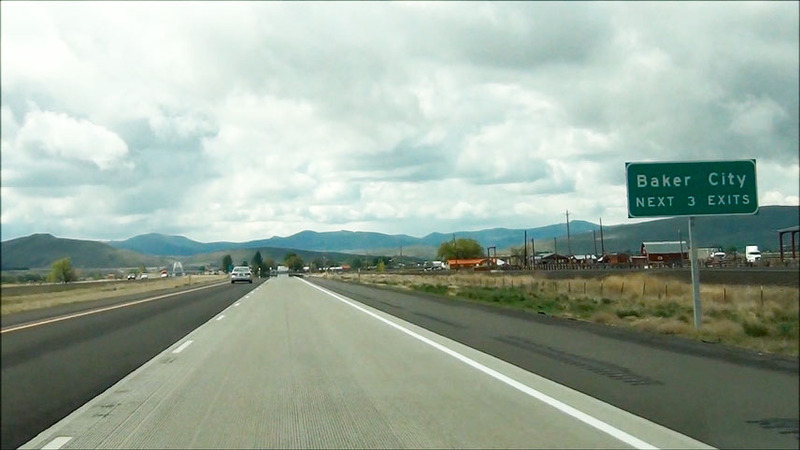 Interstate 84 East: Road view from near mile marker 320. (Photo taken 5/22/13). 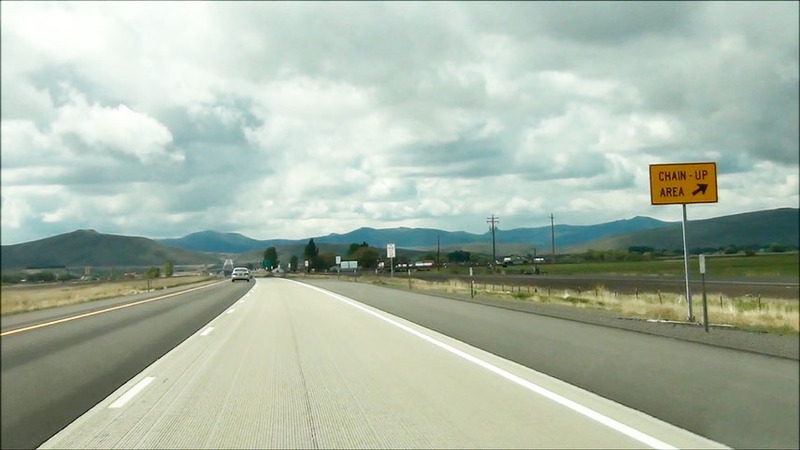 Interstate 84 East: Road view from mile marker 324. (Photo taken 5/22/13). 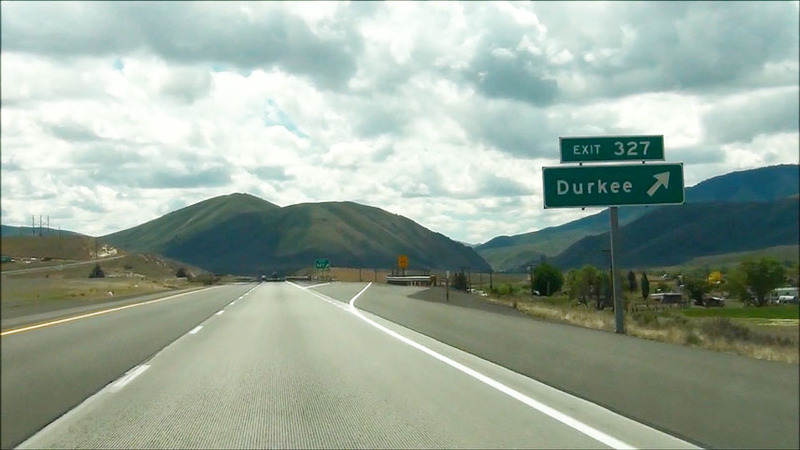 Interstate 84 East at Exit 327: Durkee (Photo taken 5/22/13). 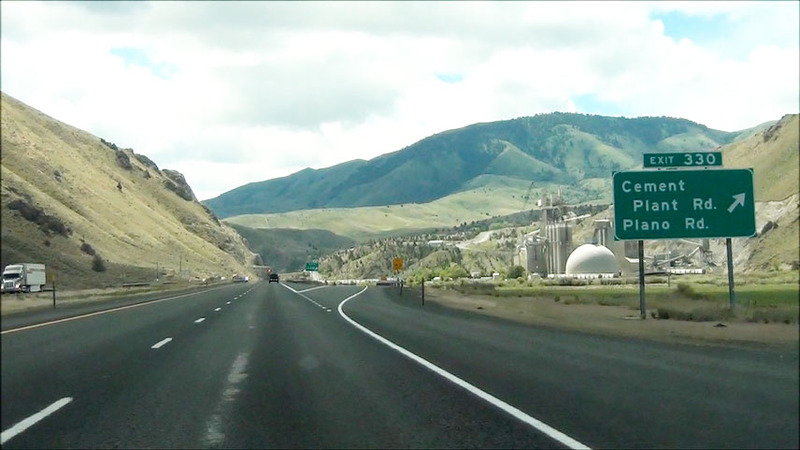 Interstate 84 East at Exit 330: Cement Plant Rd / Plano Rd (Photo taken 5/22/13). 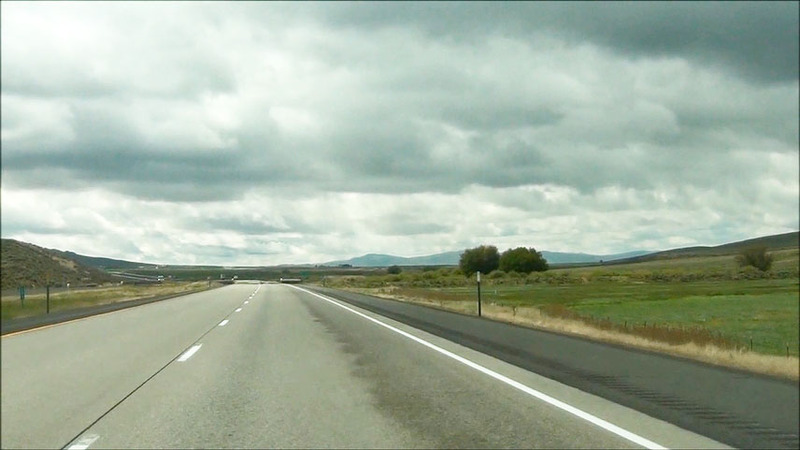 Interstate 84 East: Road view from mile marker 334. (Photo taken 5/22/13). 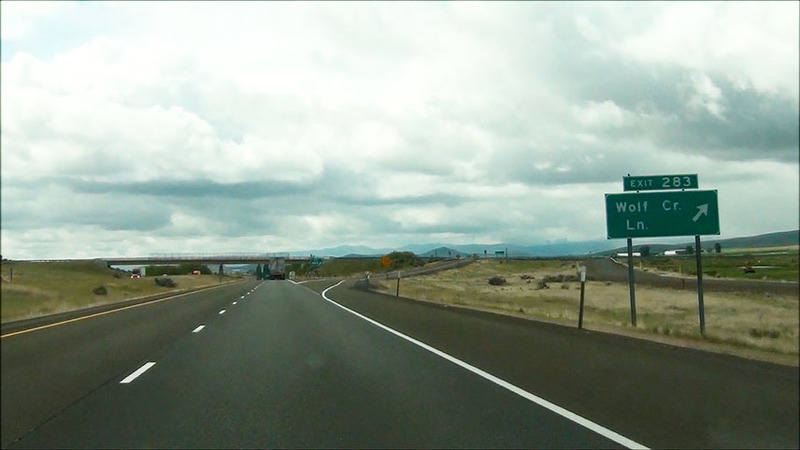 Interstate 84 East at Exit 335: Weatherby (Photo taken 5/22/13). 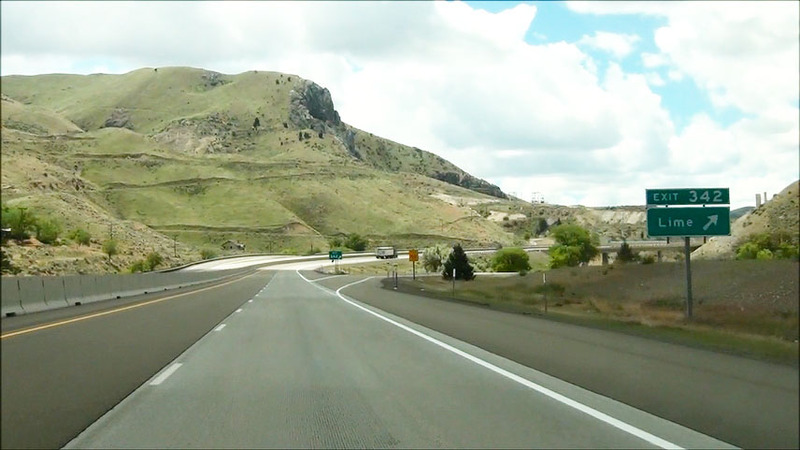 Interstate 84 East at Exit 338: Lookout Mountain (Photo taken 5/22/13). 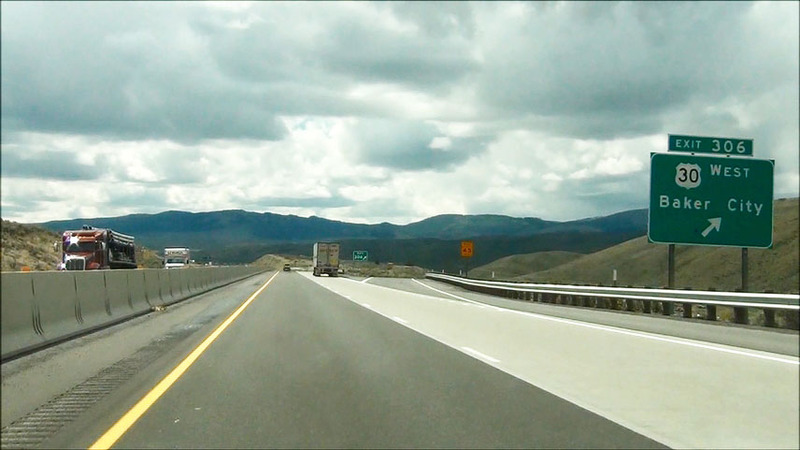 Interstate 84 East at Exit 340: Rye Valley (Photo taken 5/22/13). 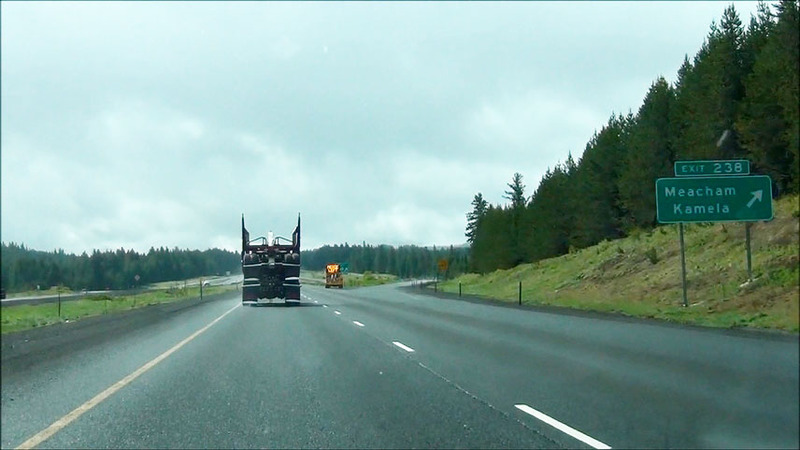 Interstate 84 East at Exit 342: Lime (Photo taken 5/22/13). Take Exit 345 to Snake River Area and Van Ornum Battle Site. (Photo taken 5/22/13). 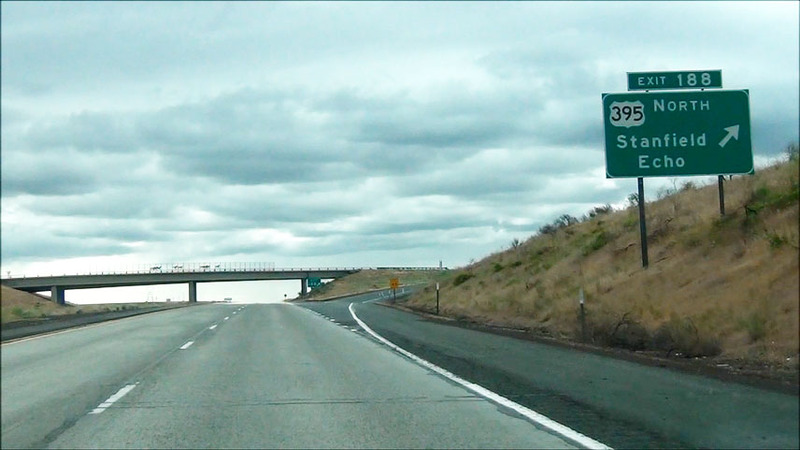 Interstate 84 East at Exit 345: US 30 BR - Huntington (Photo taken 5/22/13). 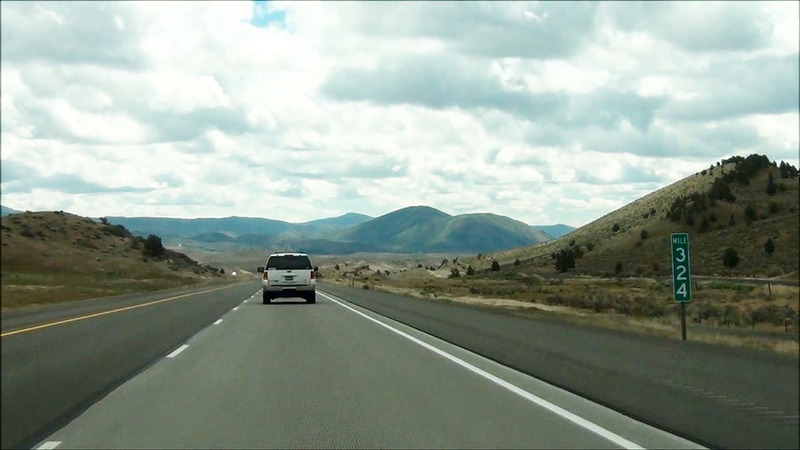 Interstate 84 East: Road view from near mile marker 349. (Photo taken 5/22/13). 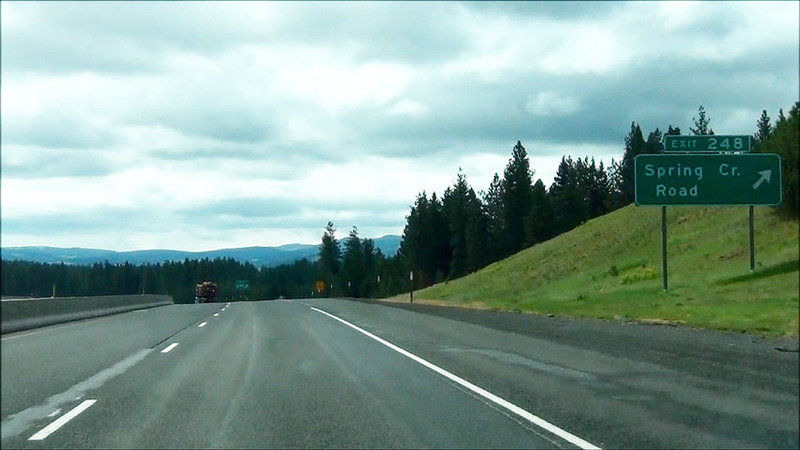 Interstate 84 East at Exit 353: Farewell Bend State Park (Photo taken 5/22/13). 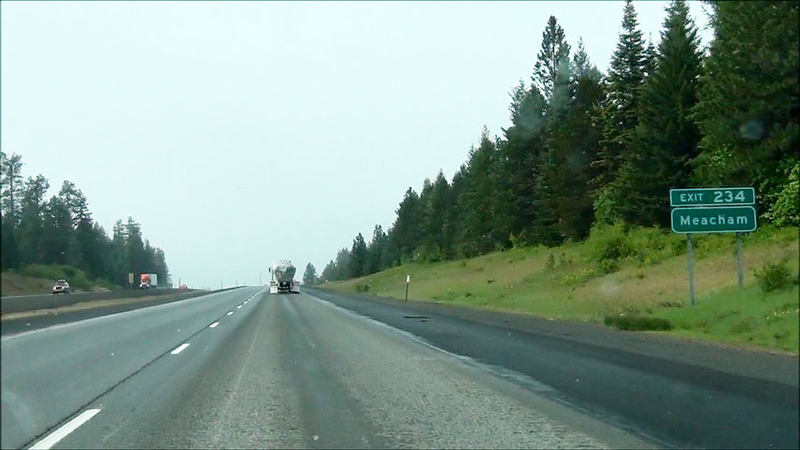 Interstate 84 East at Exit 356: OR 201 - Weiser (Photo taken 5/22/13). 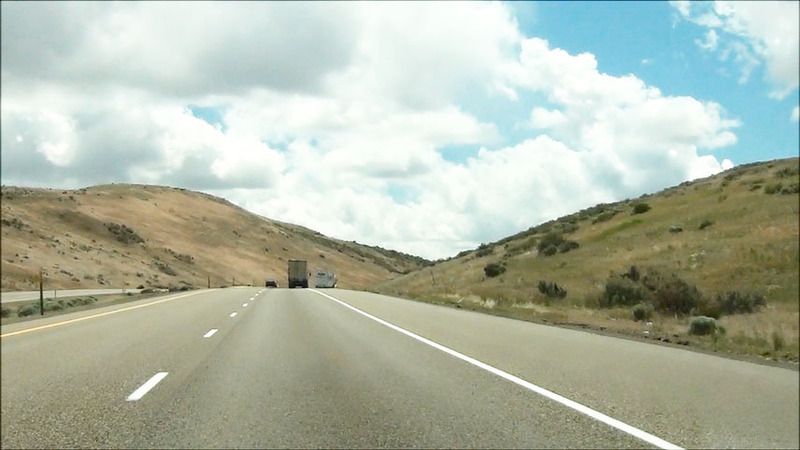 Interstate 84 East: Road view from near mile marker 360. (Photo taken 5/22/13). 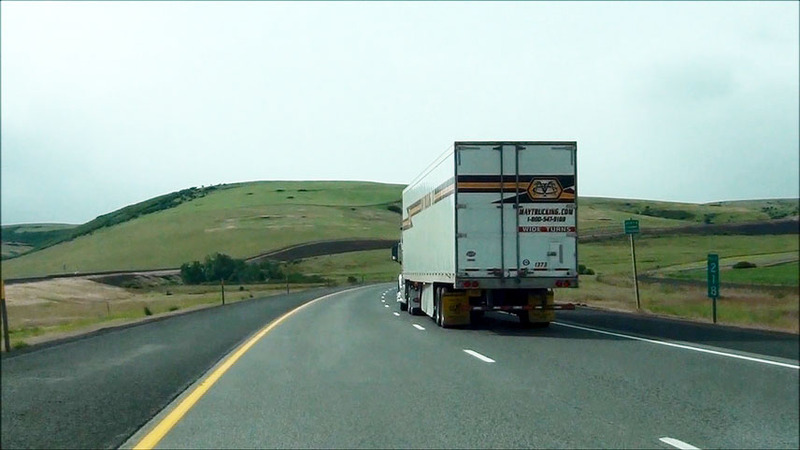 Interstate 84 East at Exit 362: Moores Hollow Rd (Photo taken 5/22/13). 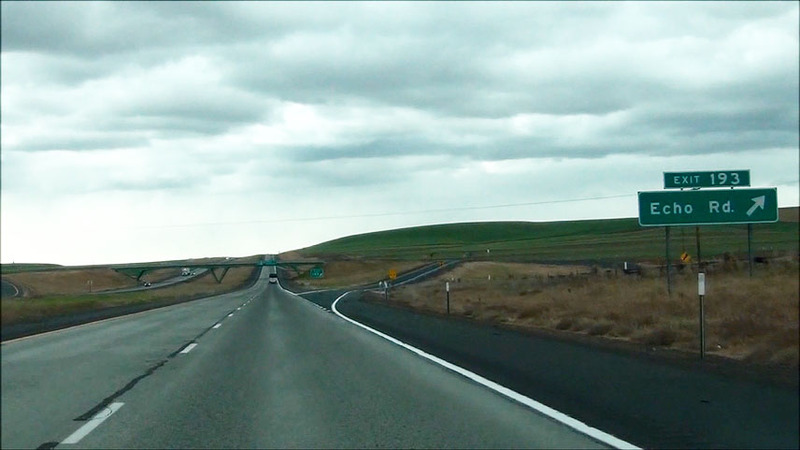 Interstate 84 East: Road view from near mile marker 367. (Photo taken 5/22/13). Take the next exit (Exit 371) to the Correctional Institution. (Photo taken 5/22/13). 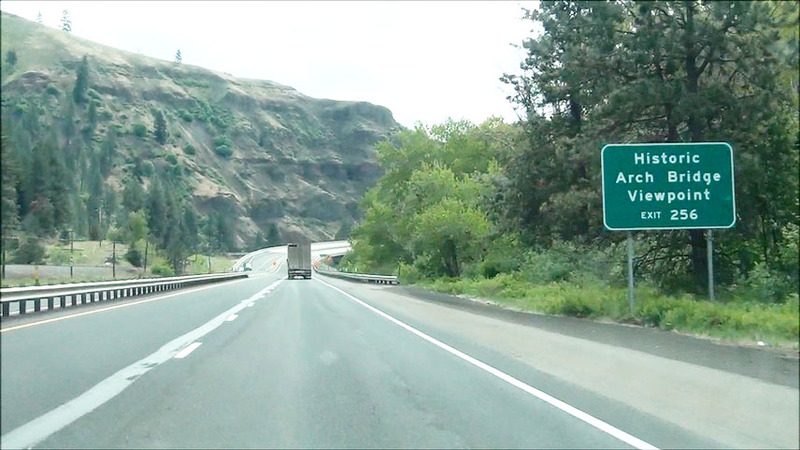 Interstate 84 East at Exit 371: Stanton Blvd (Photo taken 5/22/13). Take either of the next 2 exits to US 30 BR - Ontario. (Photo taken 5/22/13). 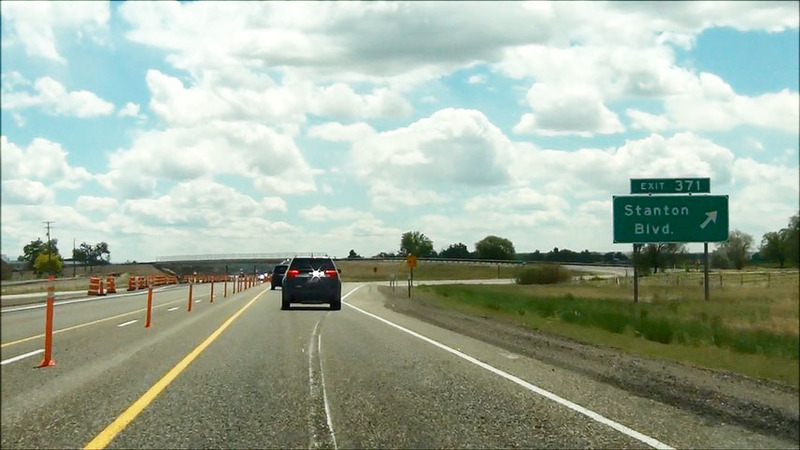 Take the next exit (Exit 374) to Ontario State Rec. Site and Lake Owyhee State Park. (Photo taken 5/22/13). 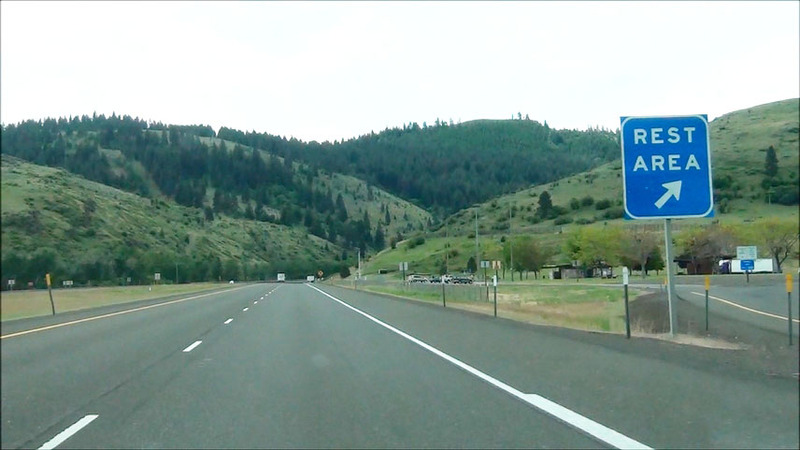 Interstate 84 East at Exit 374: OR 201 / To US 20 / To US 26 - Ontario / Vale (Photo taken 5/22/13). Take Exit 376A to Four Rivers Cultural Museum. (Photo taken 5/22/13). Interstate 84 East at Exit 376A: US 30 BR - Ontario / T.V.C.C. (Photo taken 5/22/13). 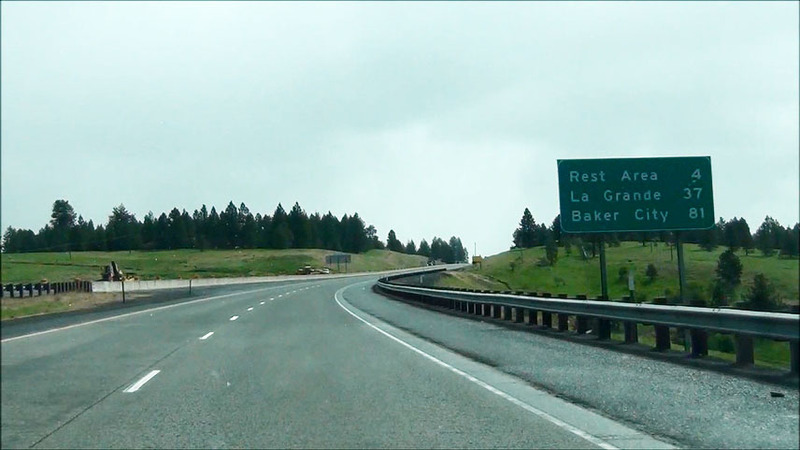 Interstate 84 East at Exit 376B: US 30 East - Payette (Photo taken 5/22/13). 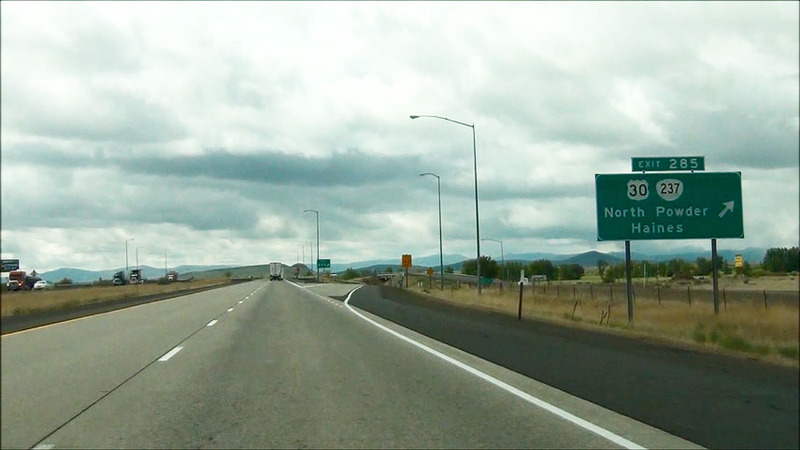 Sign as you prepare to leave Oregon and enter Idaho on Interstate 84 East. (Photo taken 5/22/13).